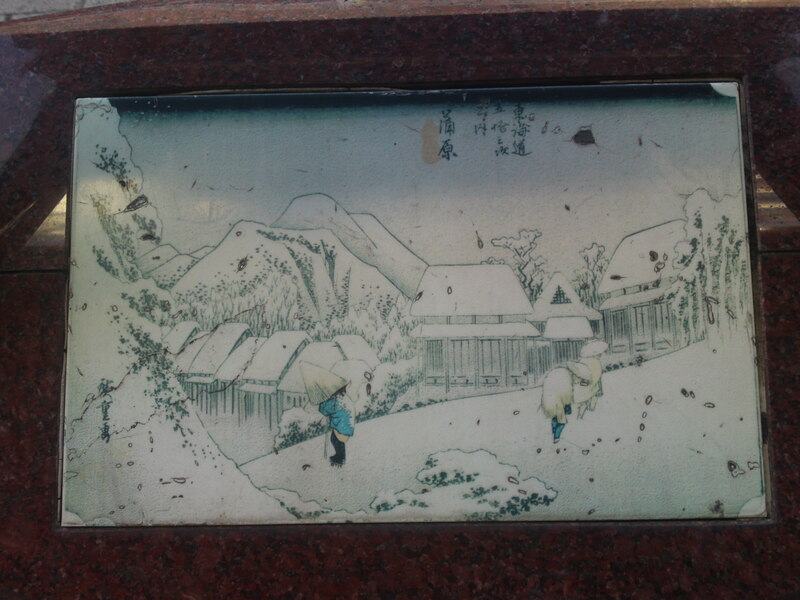 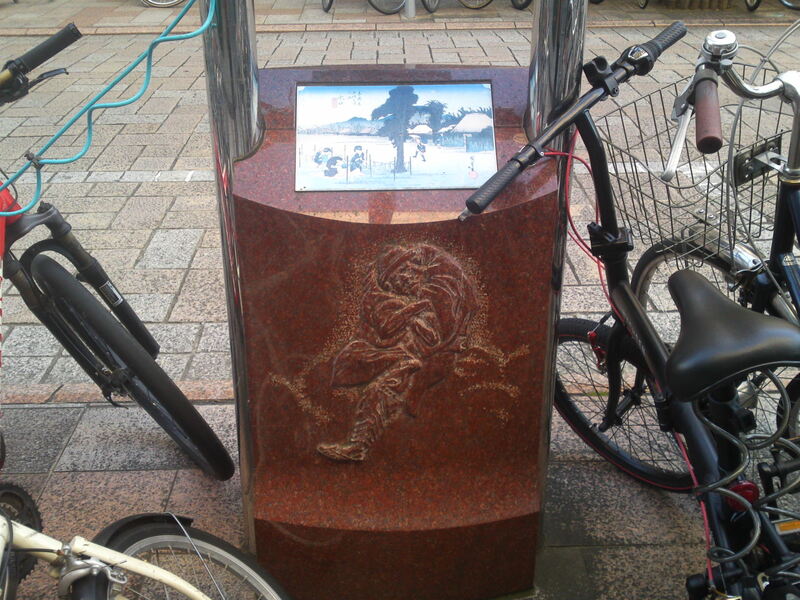 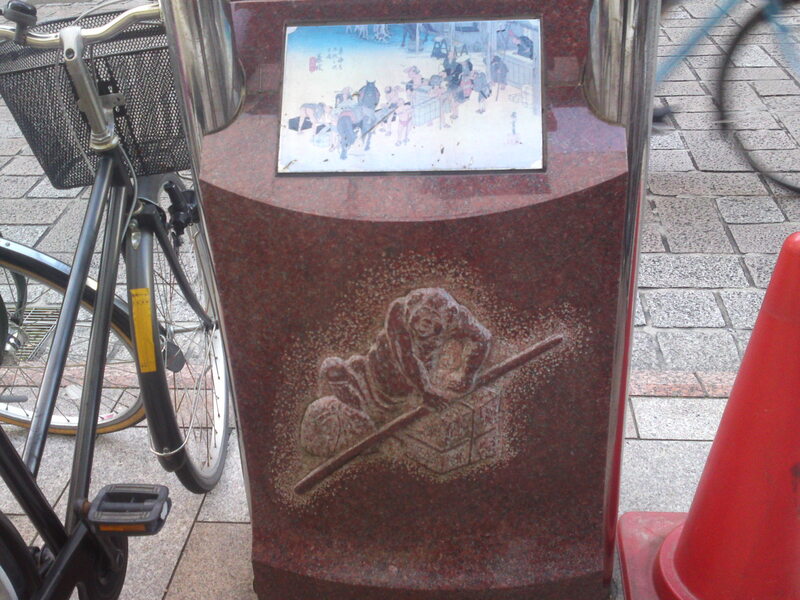 15th Station: Kambara (presently Shimizu Ku, Shizuoka City) in the snow! 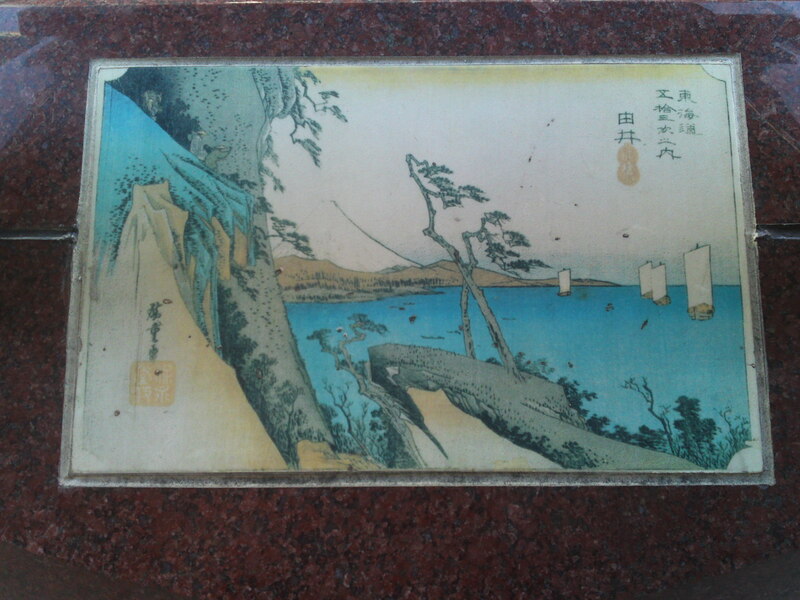 Utagawa Hiroshige (Japanese: 歌川 広重), also Andō Hiroshige (Japanese: 安藤 広重; 1797 – 12 October 1858) was a Japanese ukiyo-e artist, considered the last great master of that tradition. 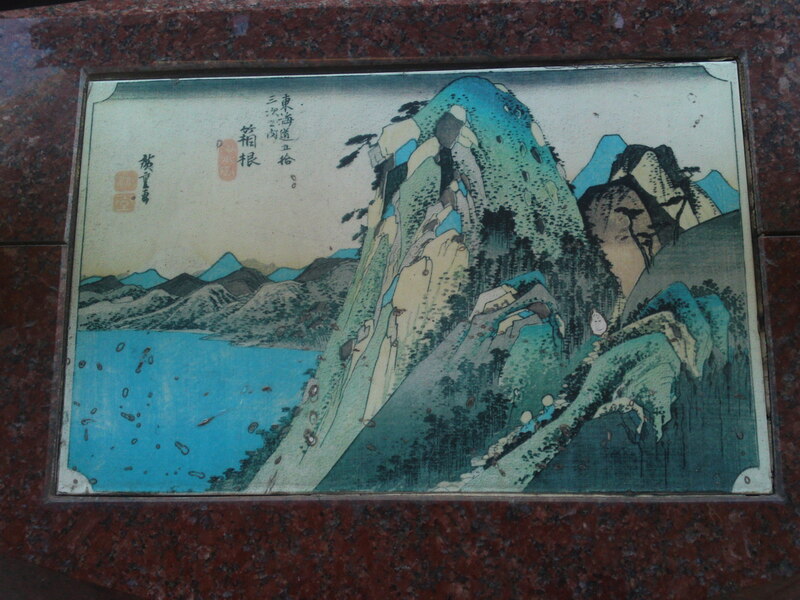 Hiroshige is best known for his landscapes, such as the series The Fifty-three Stations of the Tōkaidō. 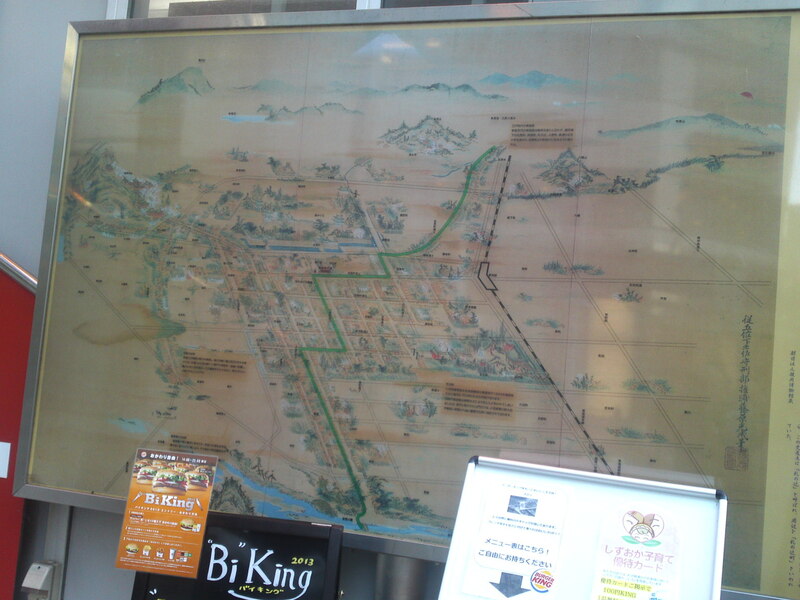 Map of old Sumpu/Shizuoka City at the crossroads by the Mitsukoshi-Isetan Department Store. 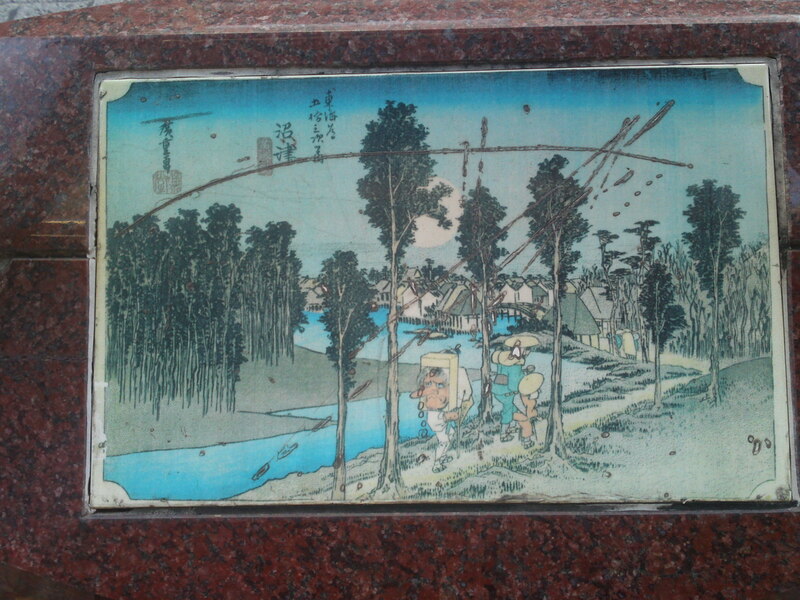 Although you can see all 53 wood block prints at the Hiroshige Museum in Yui, Shimizu Ku, Shizuoka City, did you know you can see 42 (that what I counted and took in pictures yesterday although I’ll double check today!) 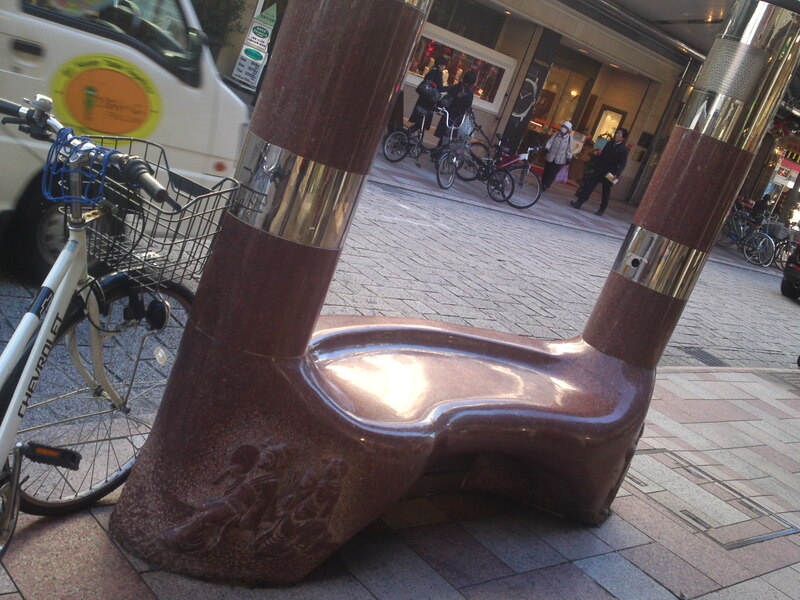 of them daily if you walk along Gofuku Cho Street? 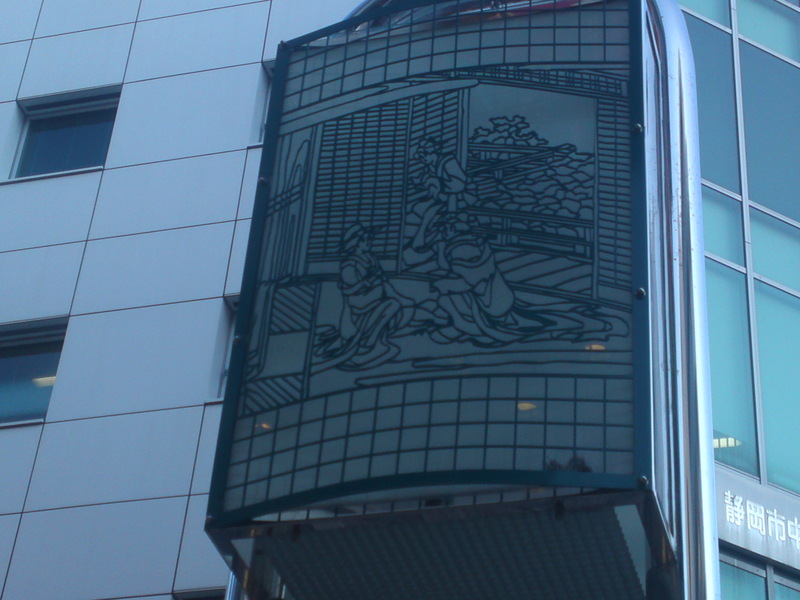 They concentrated on both sides of Gofuku Cho Street between Mitsukoshi-Isetan Department Store and Shizuoka Bank Headquarters Building. 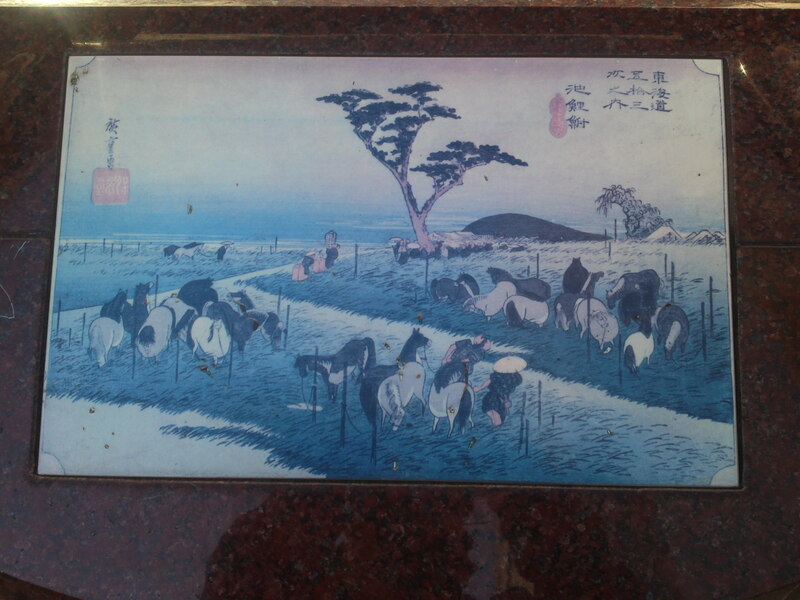 As far as I know, the order seemed haphazard and I found only 42 of the 53 wood bock prints but I will hav e to double check! 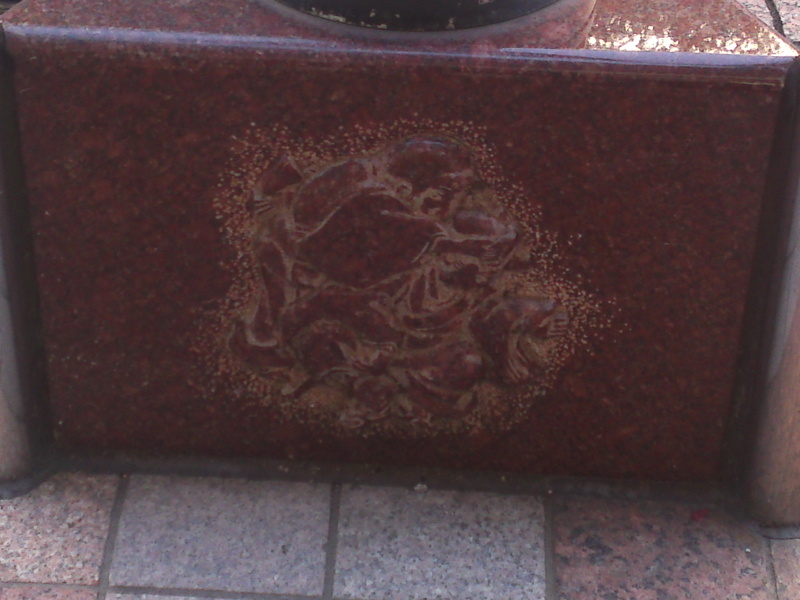 I just realized yesterday I had been walking past them for years. 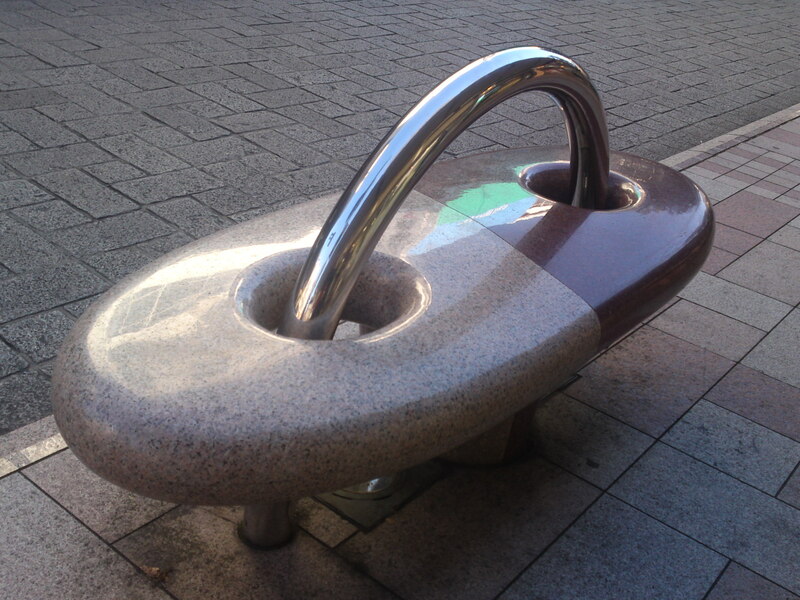 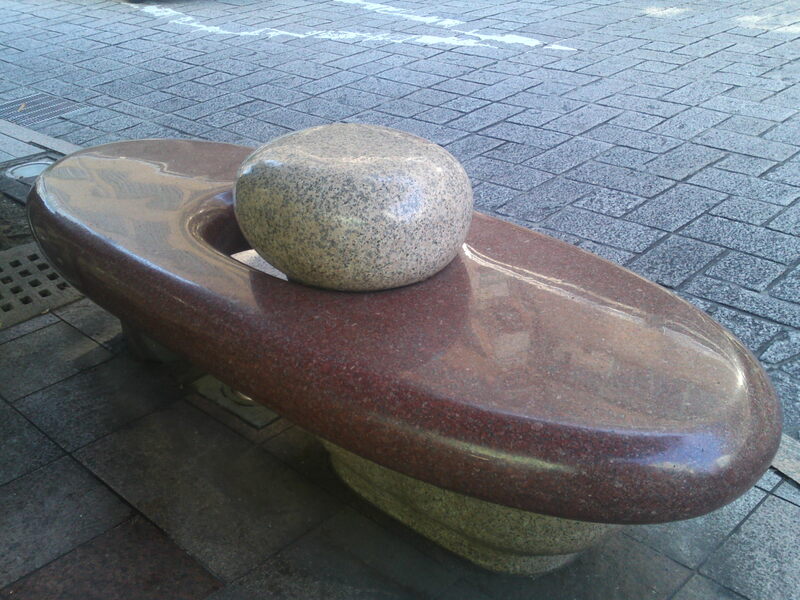 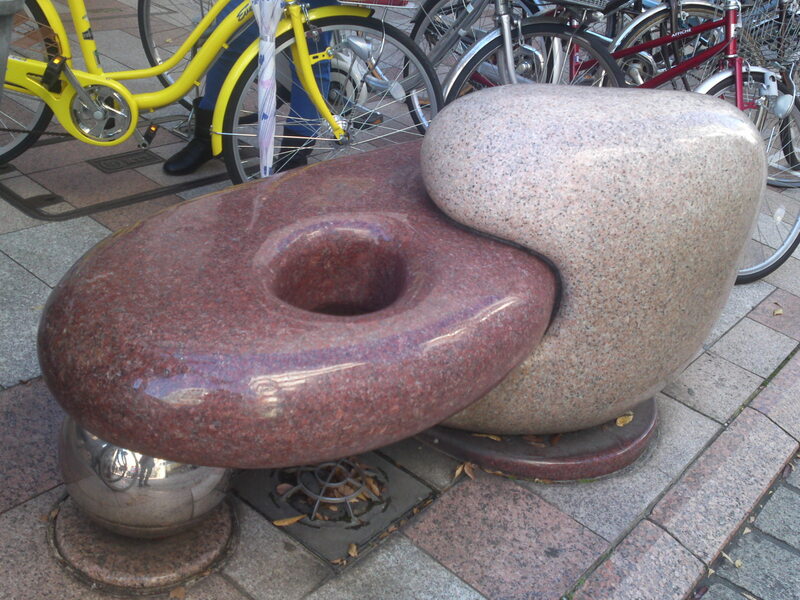 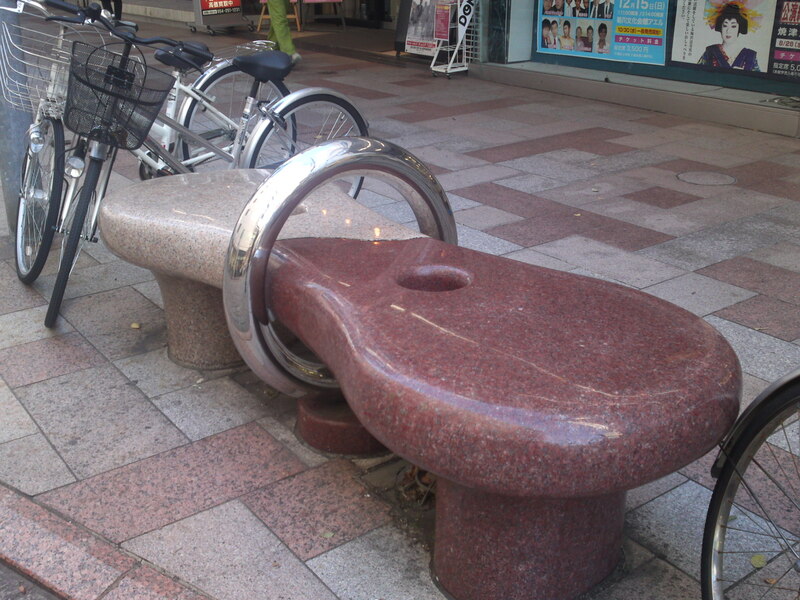 The reason for this crazy miss is that people have the habit of stacking their bicycles against the red granite pedestals on which they stand. 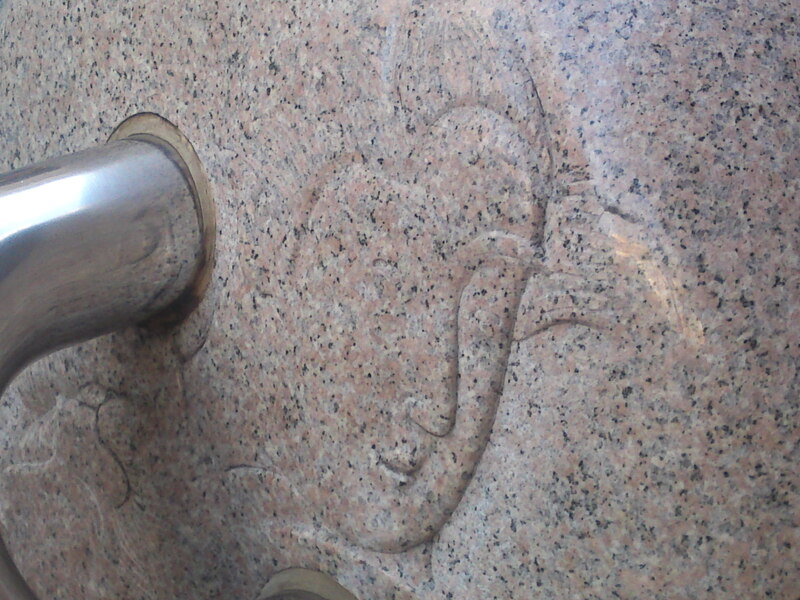 A real pity as the stands themselves are carved into beautiful reliefs , all different! 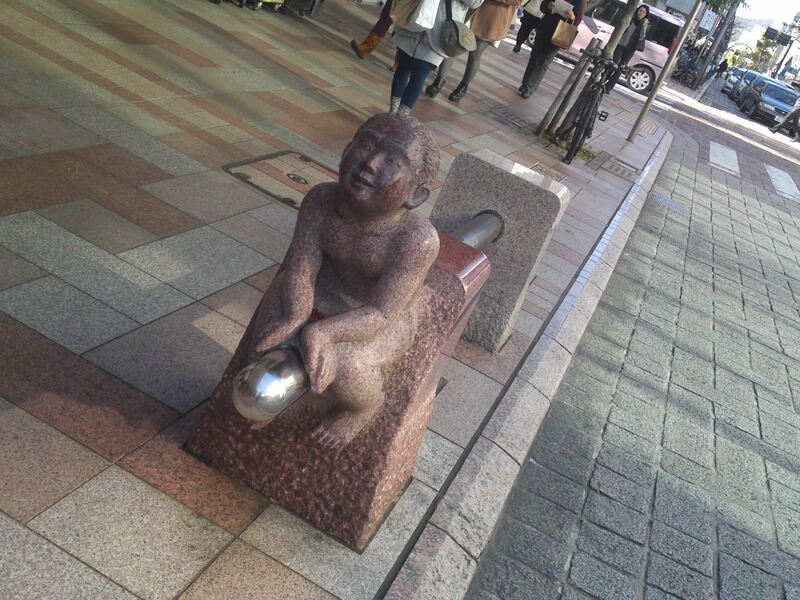 Alright, there is no point crying about it, let me take you along, then! 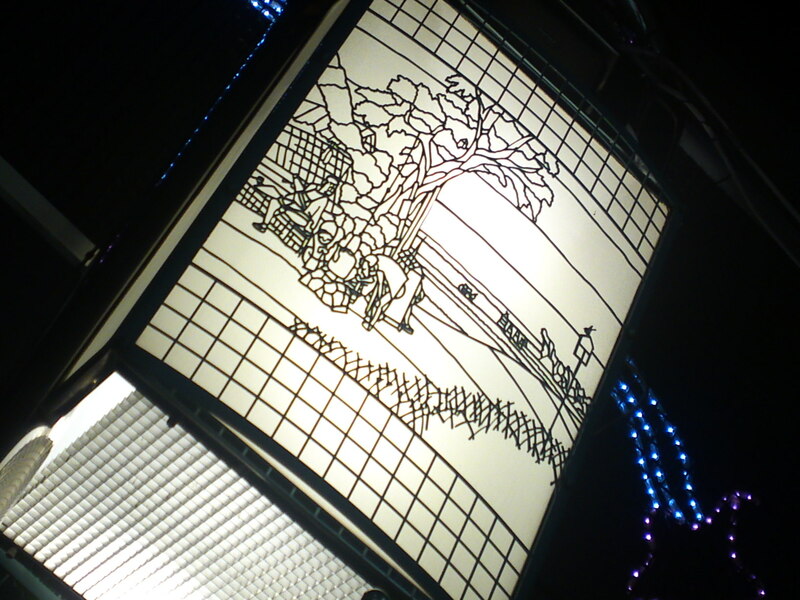 And don’t forget your camera or sketch book! 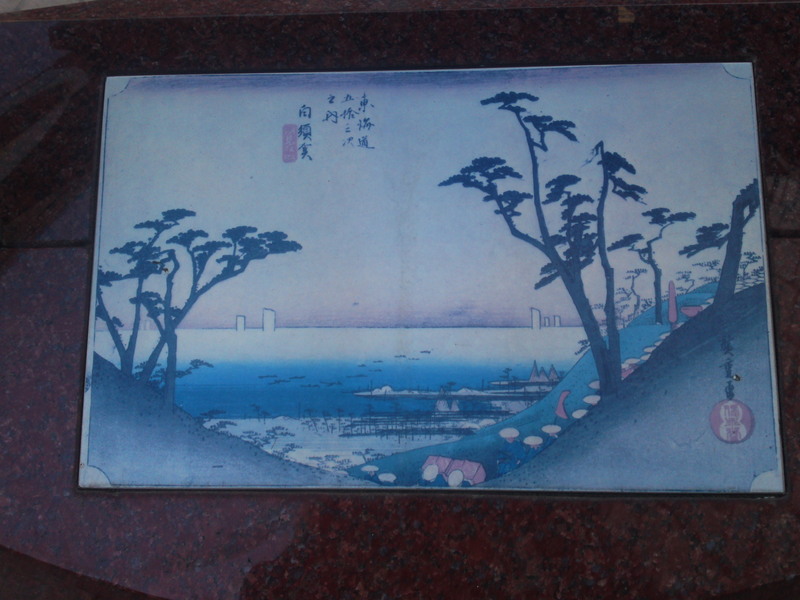 Actually Hiroshige never traveled in the snow and drew this picture from his own imagination! 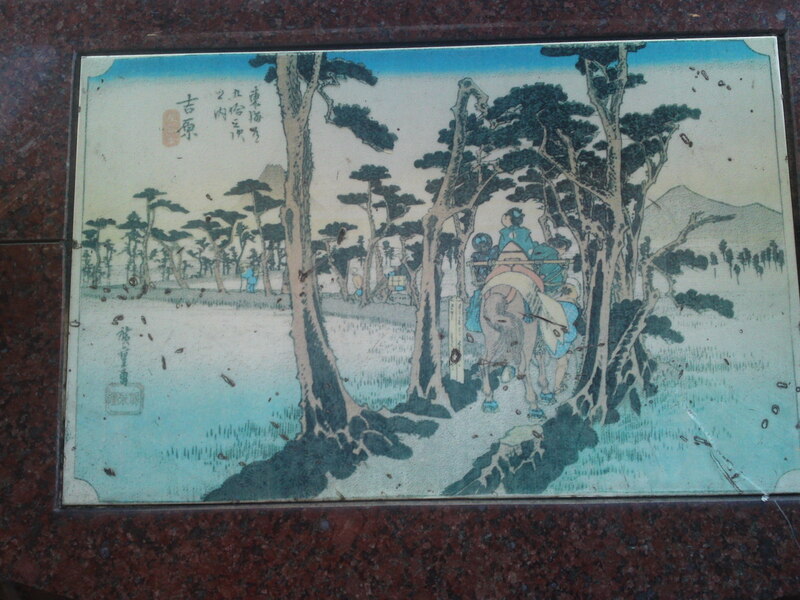 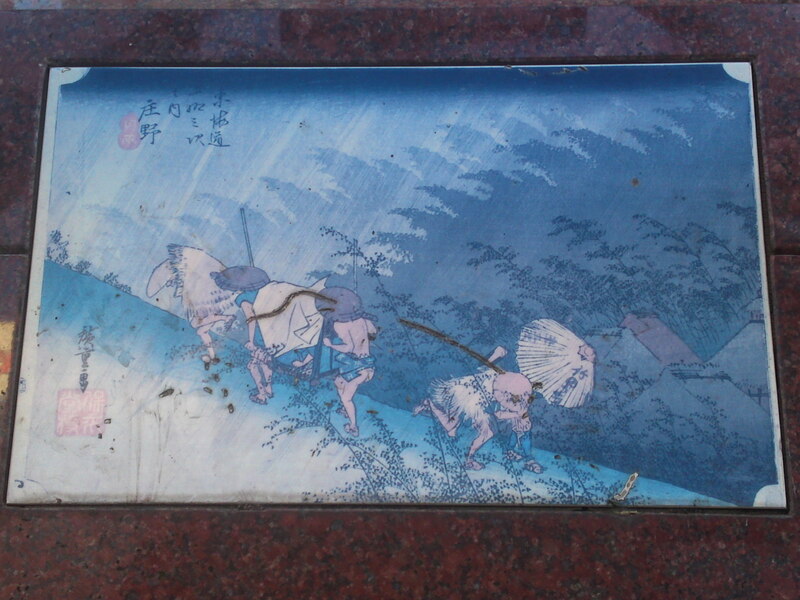 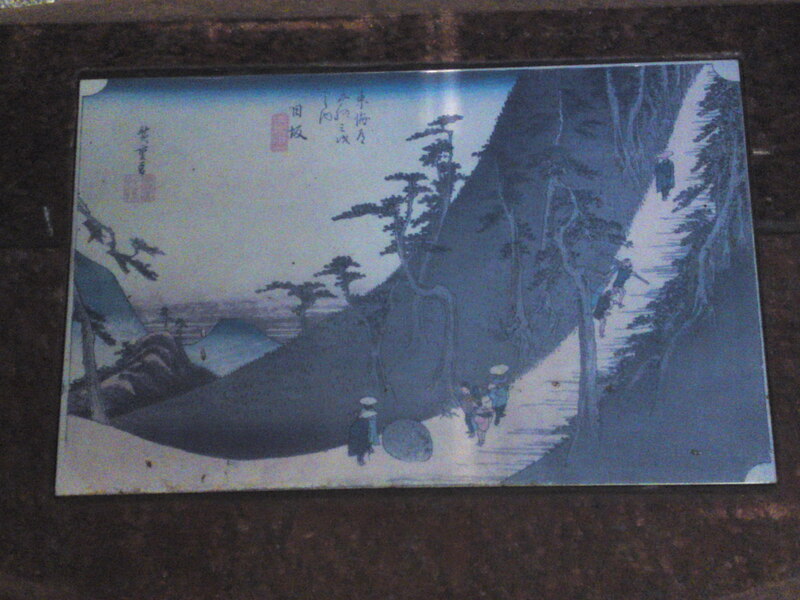 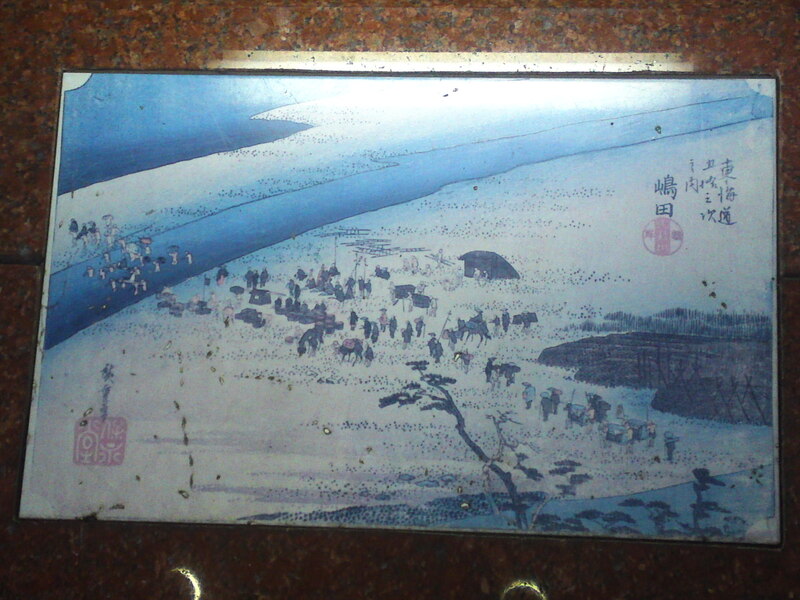 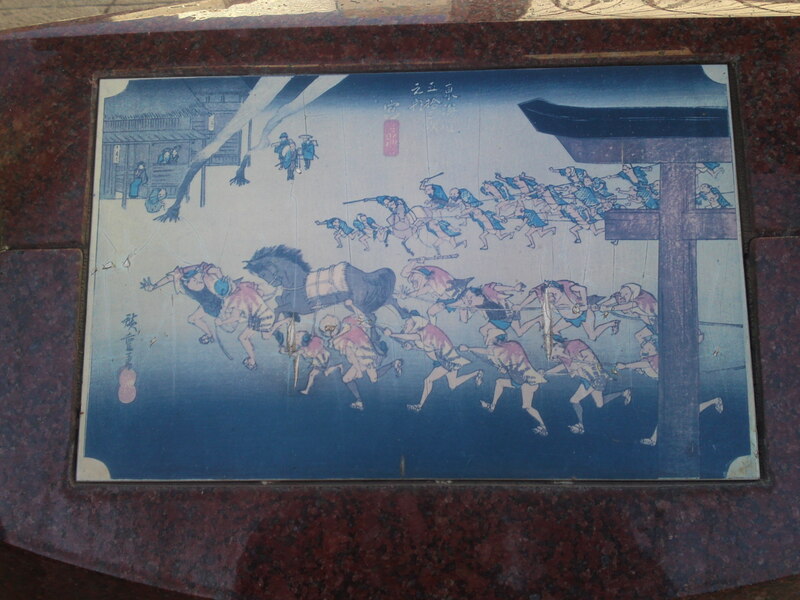 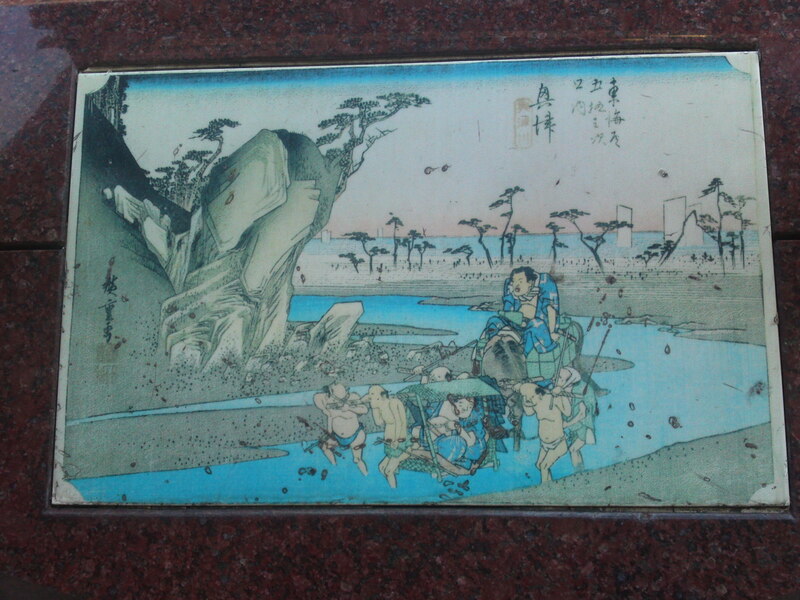 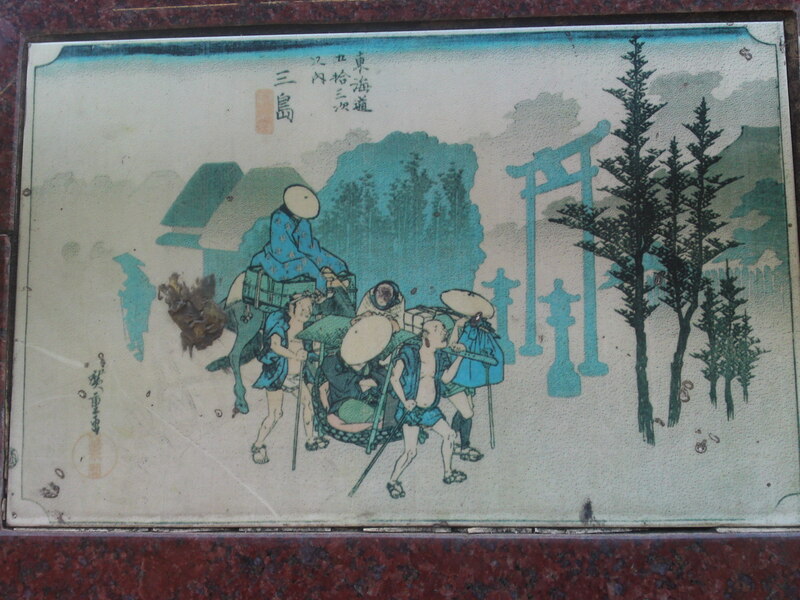 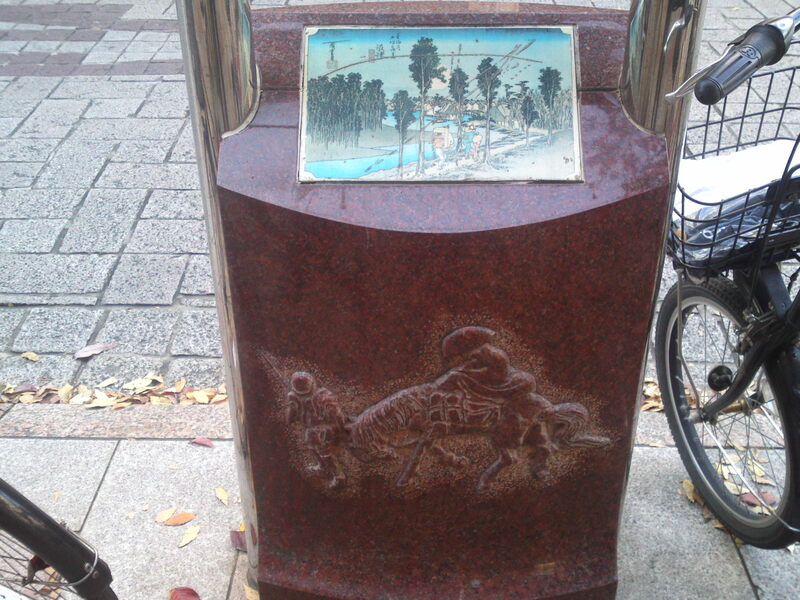 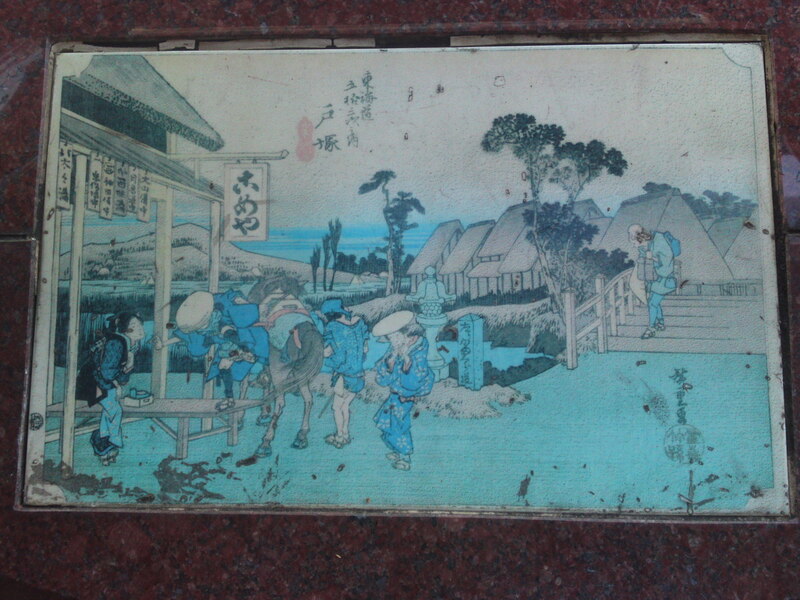 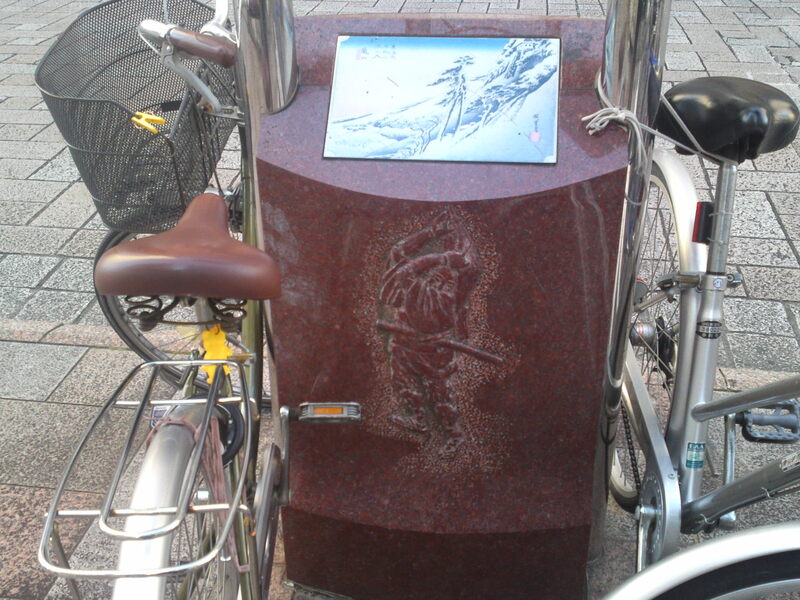 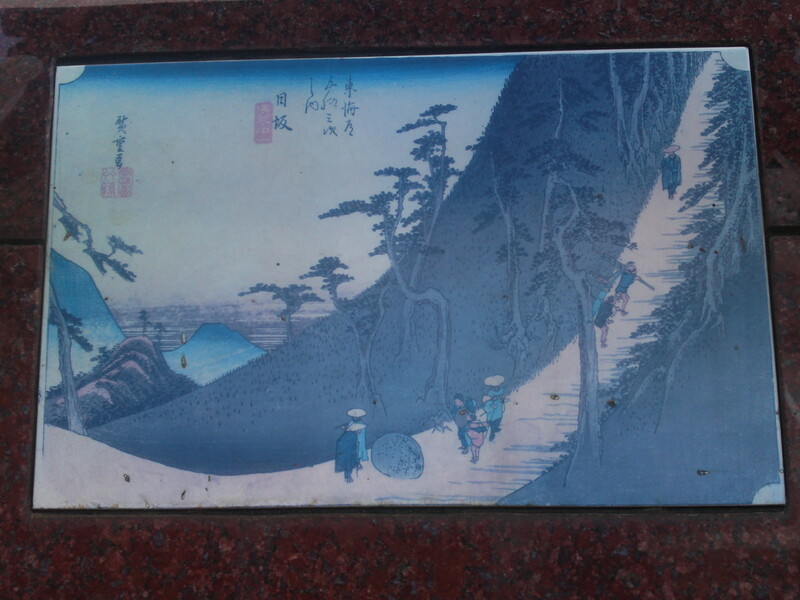 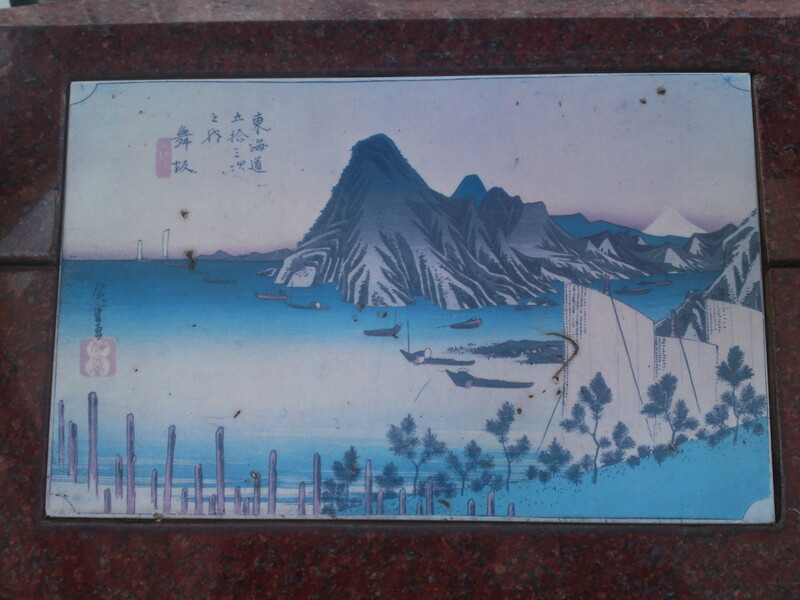 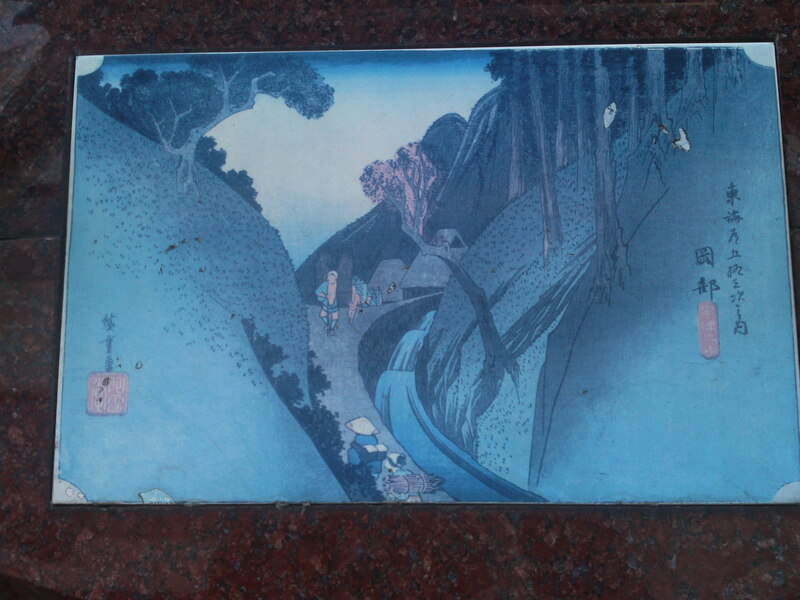 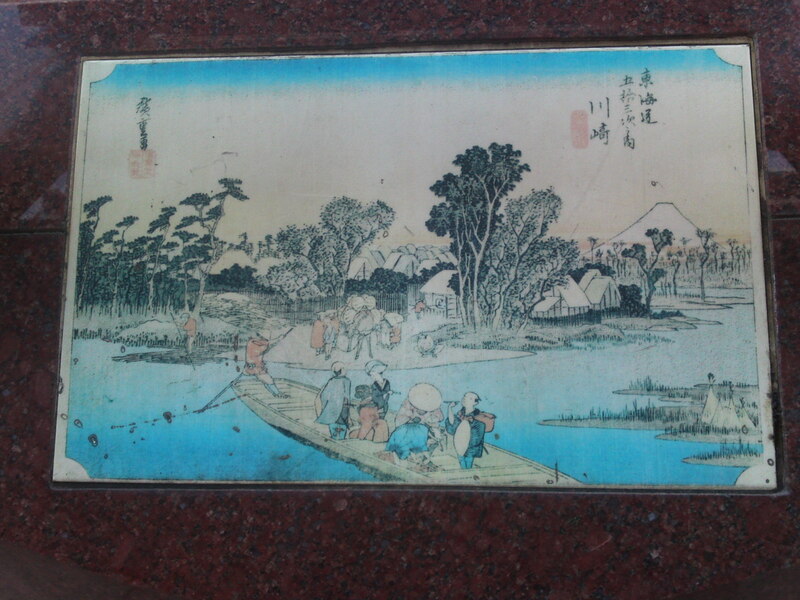 Pedestal 3) Hiroshige traveling on a horse? 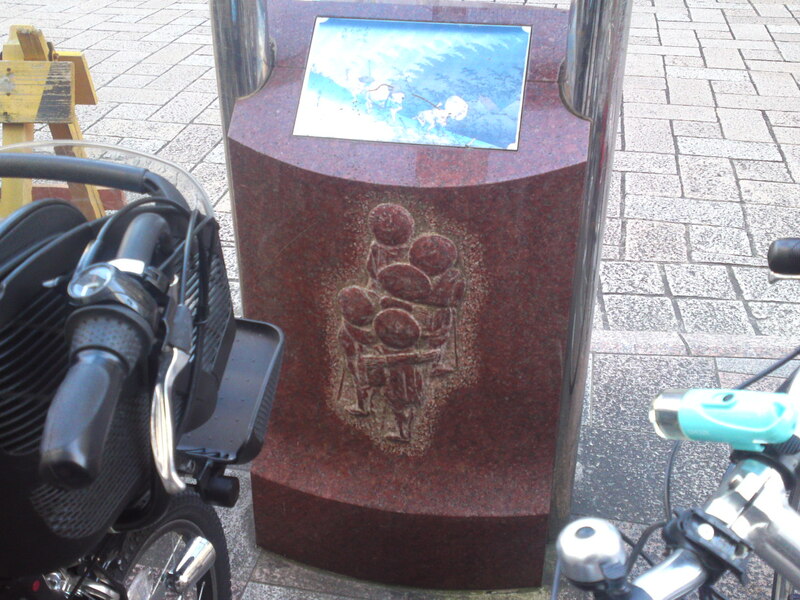 Note: I started moving bicycles away without any ceremony form that point! 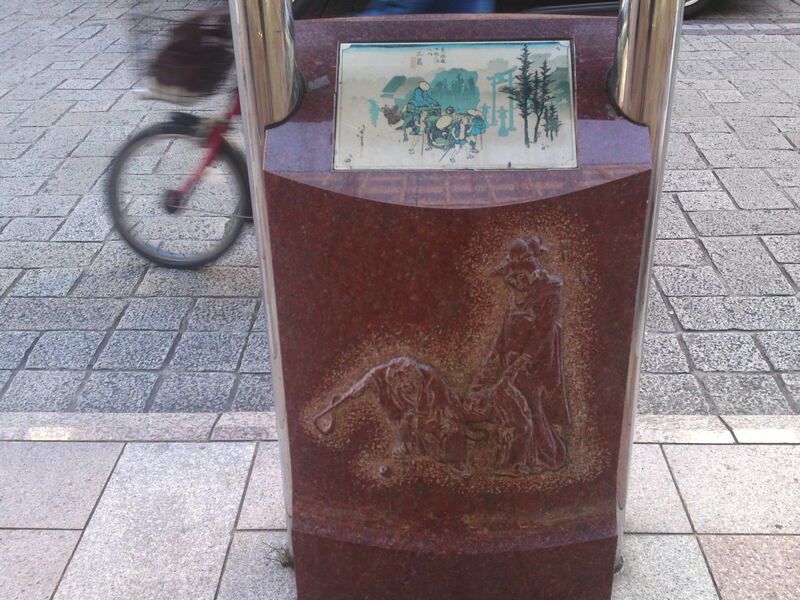 Pedestal 5) Farmer Housewife and son? 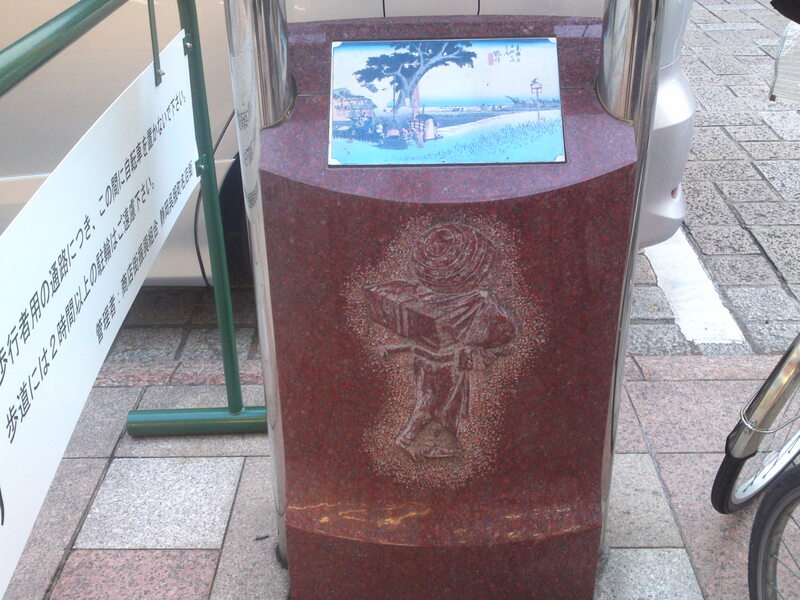 Pedestal 6) Young Lord or Kabuki actor? 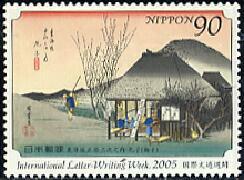 The same was reproduced on a Japanese commemorative stamp! 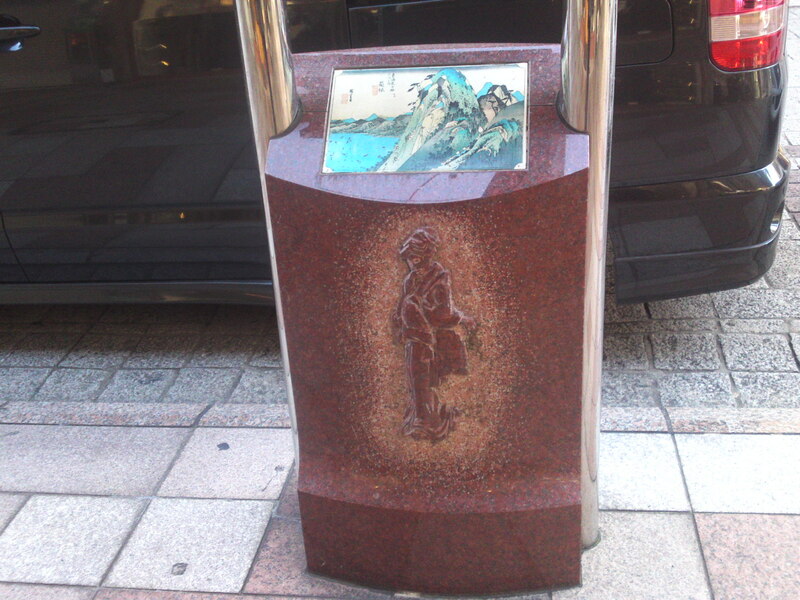 Pedestal 8) A tired porter! 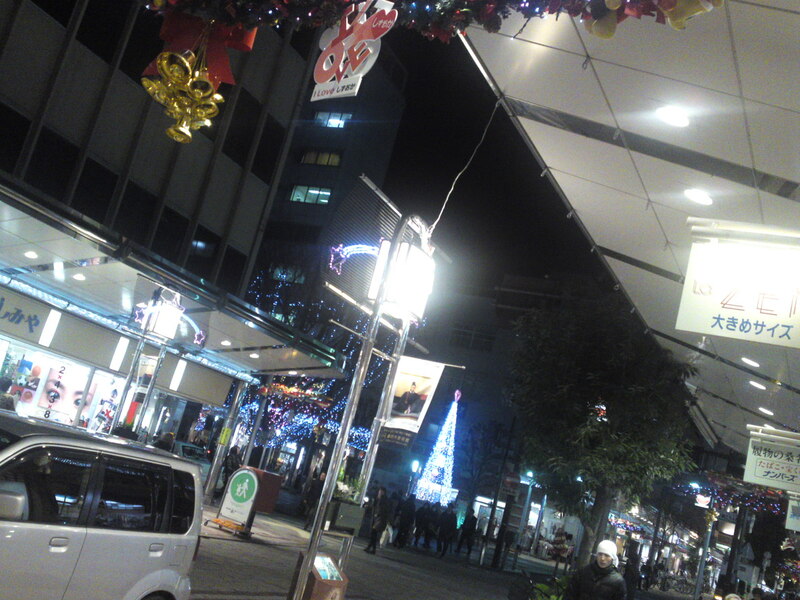 28th Station: Mitsuke (Tenryuu, presently Hamamatsu City, Shizuoka Prefecture)! 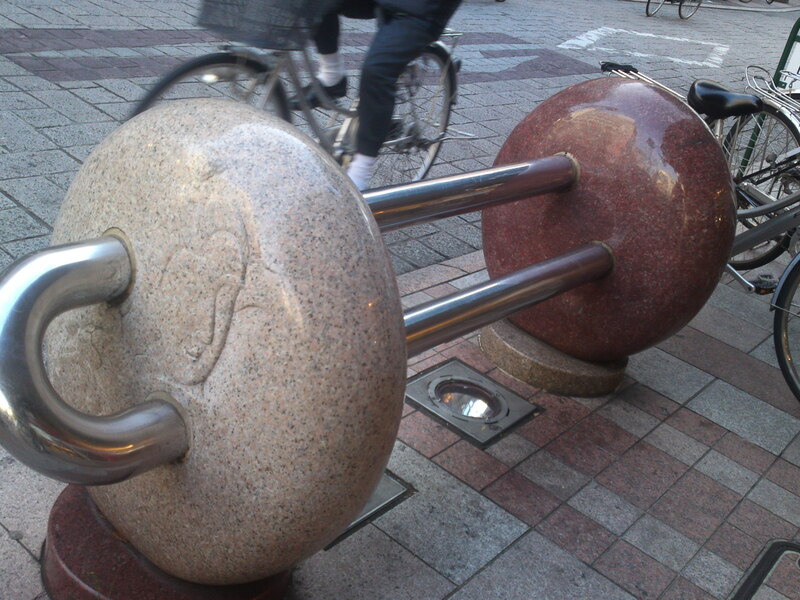 Actually I double checked and found a few more! 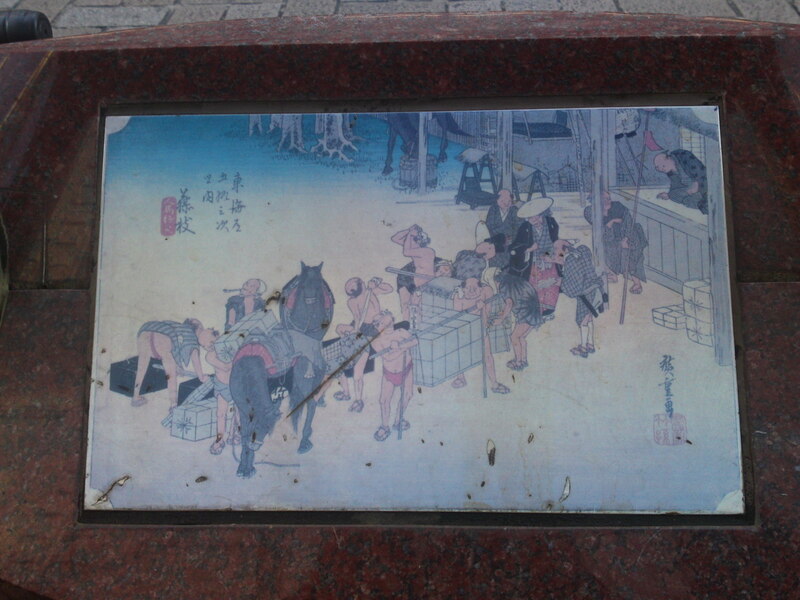 Moreover, the indications to find them were slightly wrong! 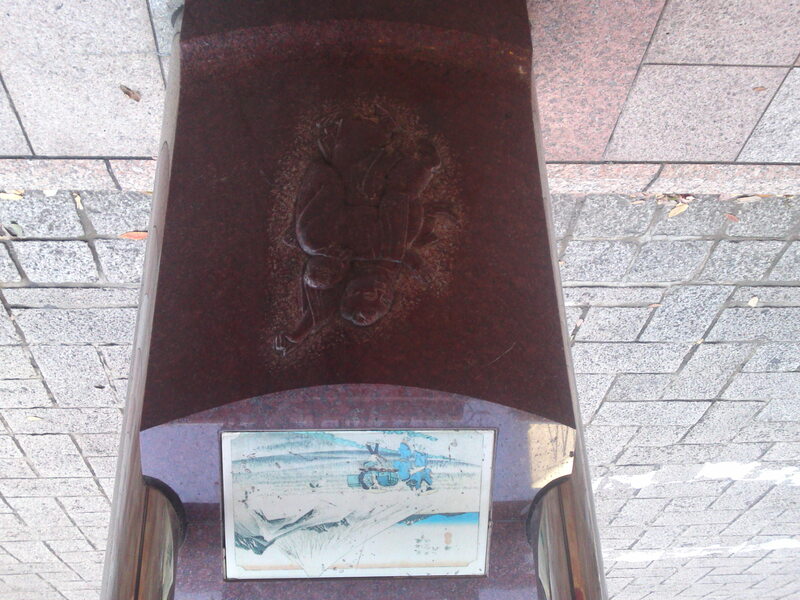 You will find all these ukiyo-e and more from along Gofuku Cho Street in Aoi Ku, Shizuoka City, past the first crossing up the street from Gofuk Cho Scrmable, that is where Gofuku-Cho Street crosses the main Street called Egawa Street up the Shizuoka Bank headquarters! 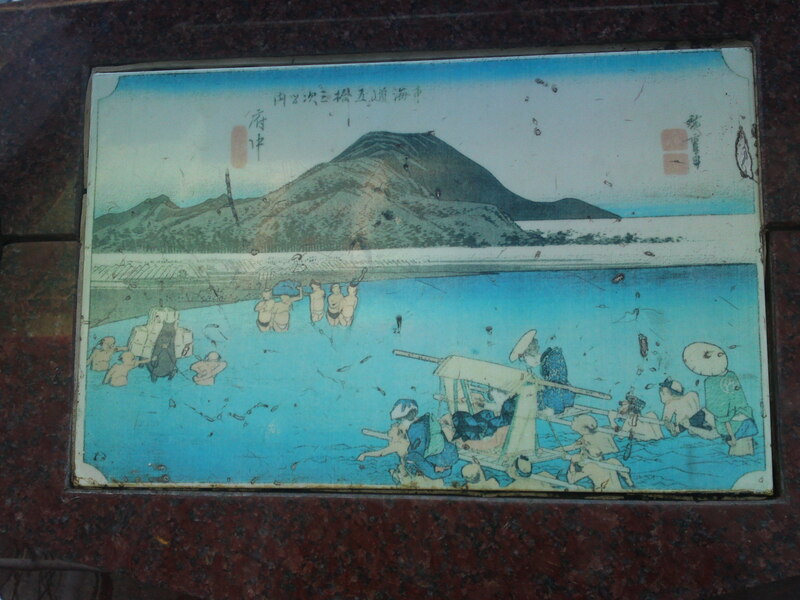 Mount Fuji overlooking Shizuoka City, formerly called “Fuchu” or “Sumpu”! 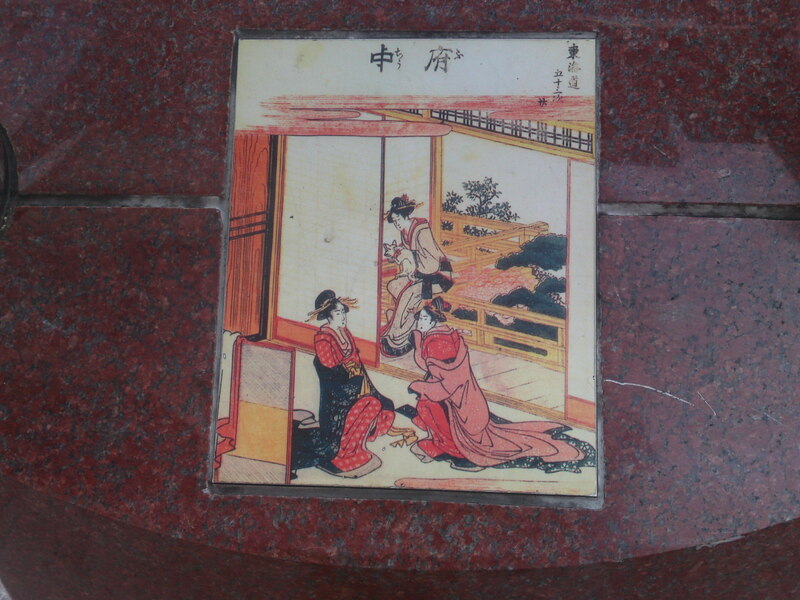 Alright, let me take you back to the Wood Block Prints! 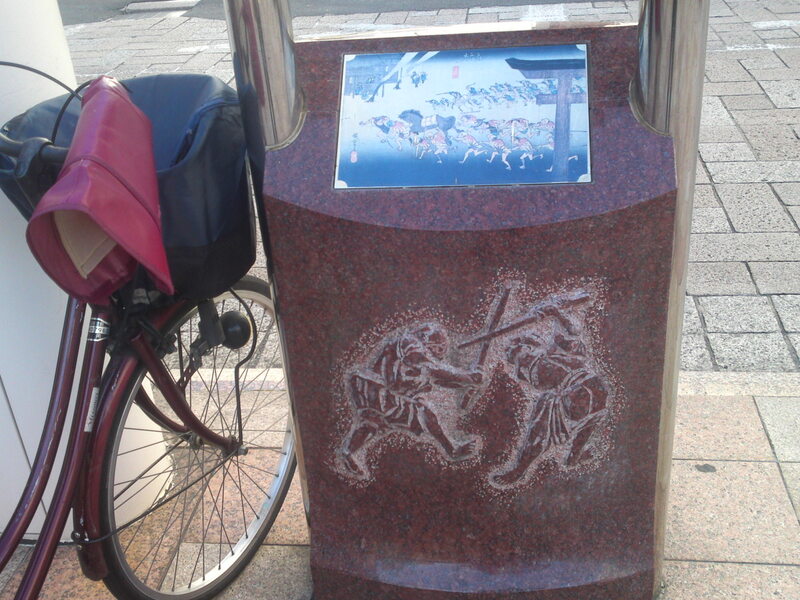 30th Station: Maisaka (presently part of Hamamatsu City, Shizuoka Prefecture)! 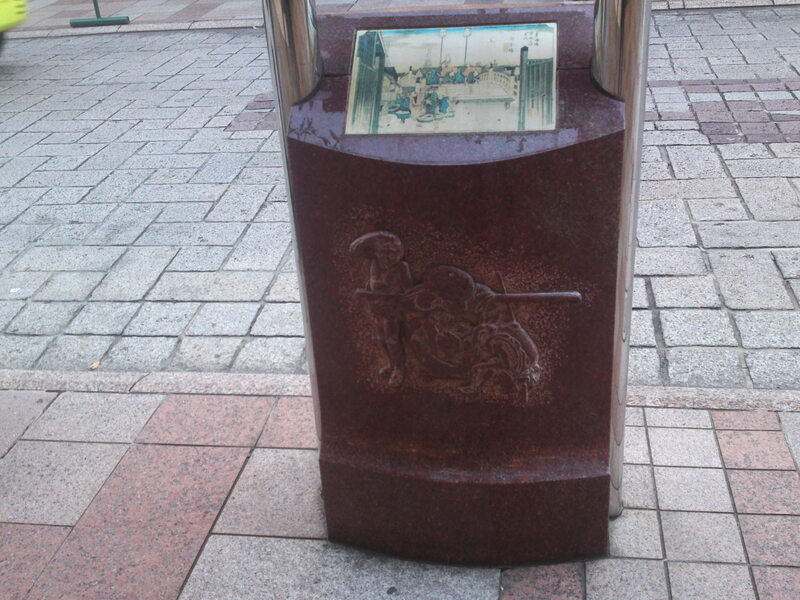 31st Station: Arai (presently part of Kosai City, Shizuoka Prefecture)! 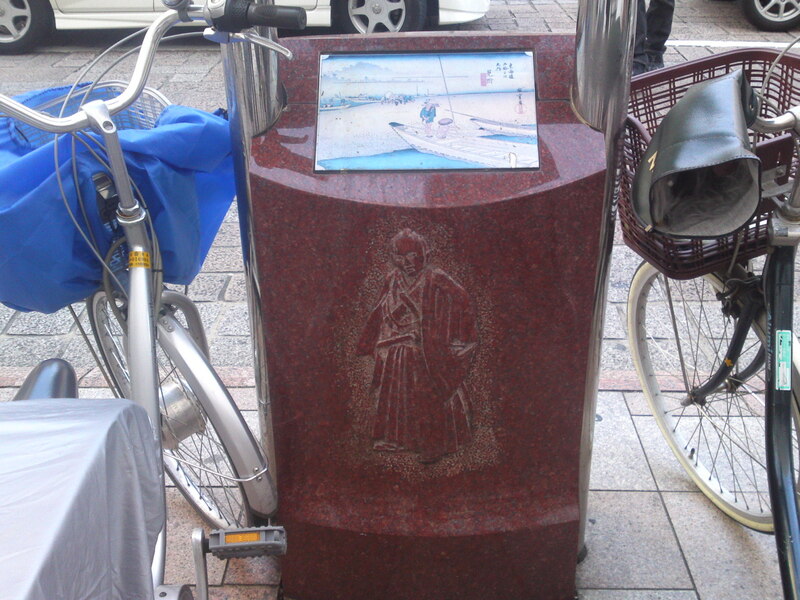 35th Station: Yoshida (presently part of Toyohashi City, Aichi Prefecture)! 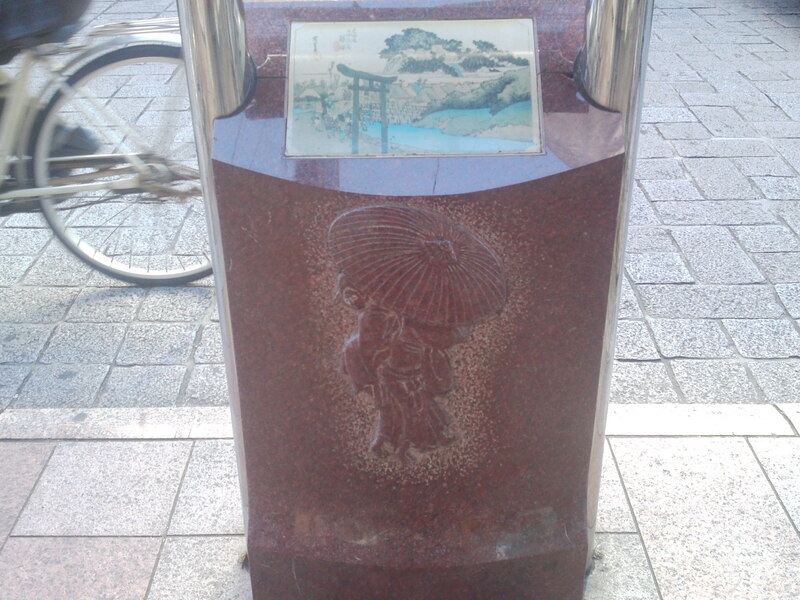 Pedestal 15) Woman with Umbrella! 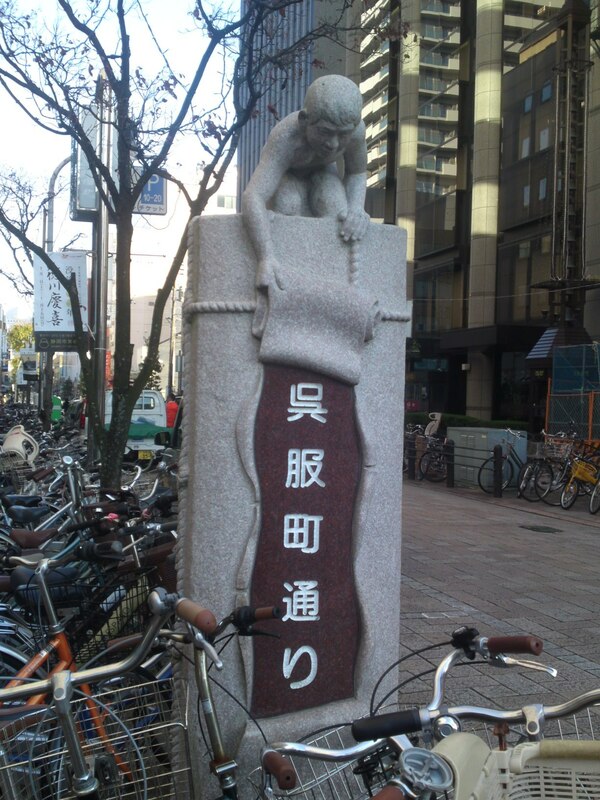 36th Station: Akasaka (presently in Toyokawa City, Aichi Prefecture)! 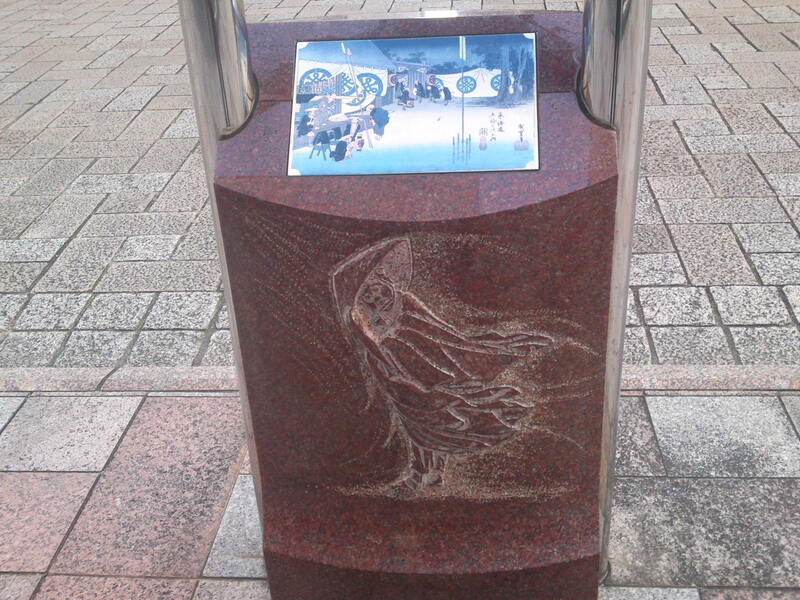 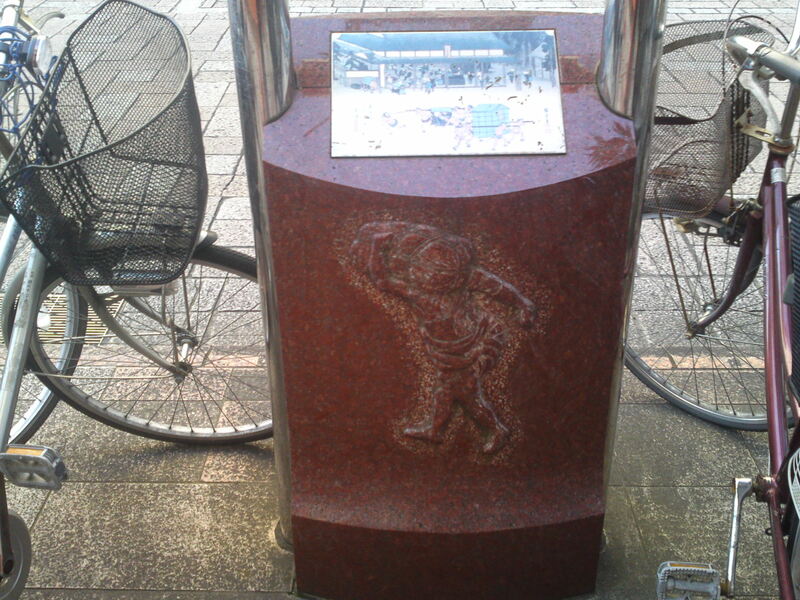 39th Station: Chiryu (Chiru City, Aichi Prefecture)! 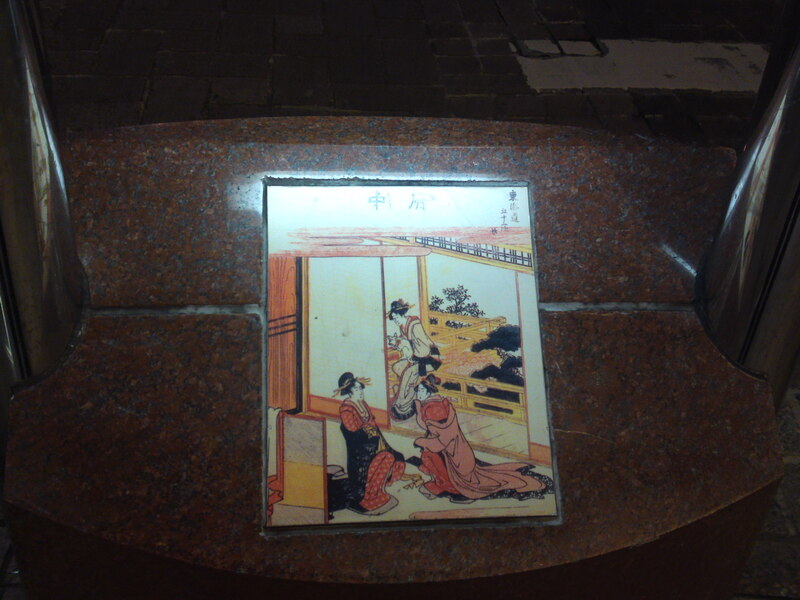 Pedestal 17) Wooden Sword Fencing Practice! 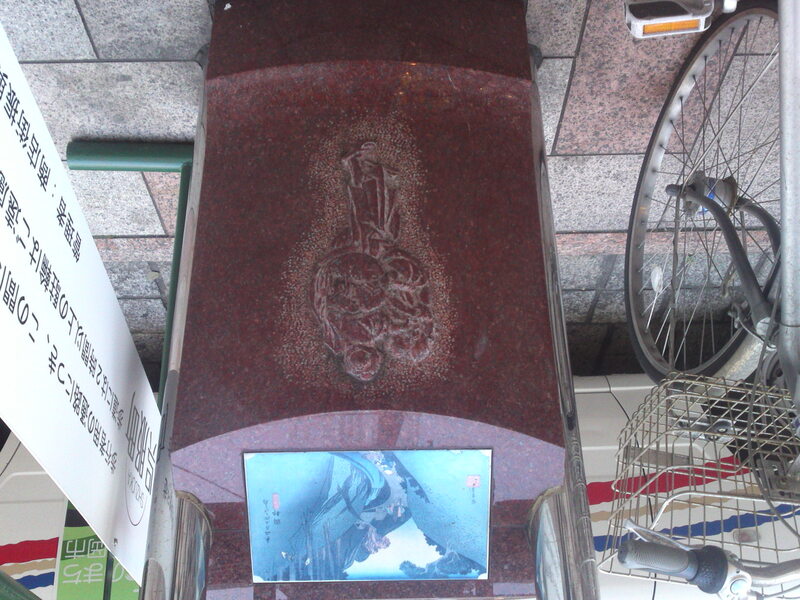 41st Station: Miya (presently part of Atsuta ku, Nagoya City, Aichi Prefecture)! 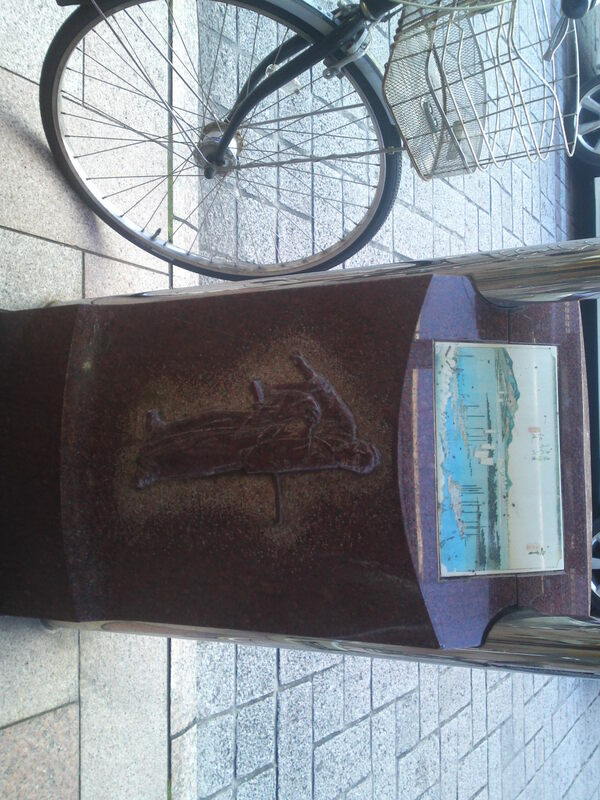 43rd Station: Yokkaichi (Yokkaichi City, mie Prefecture)! 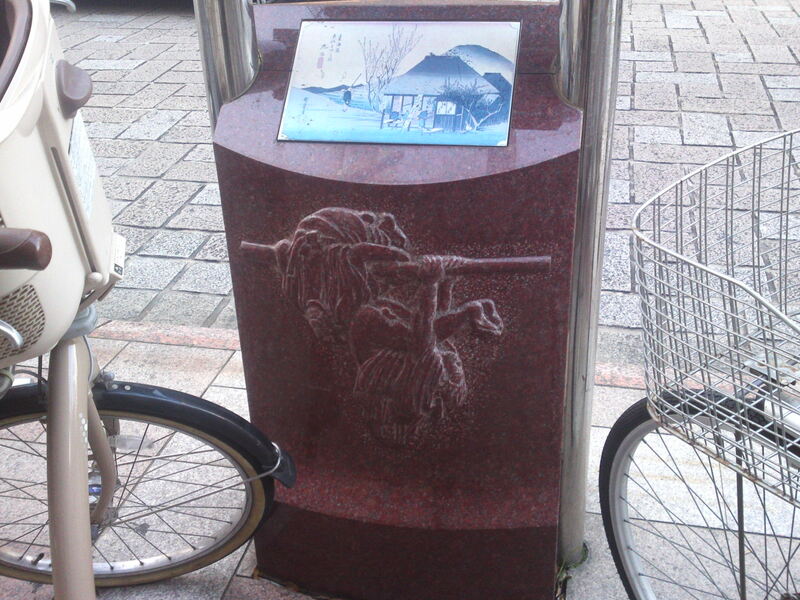 46th Station: Kameyama (Kameayama City, Mie Prefecture)! 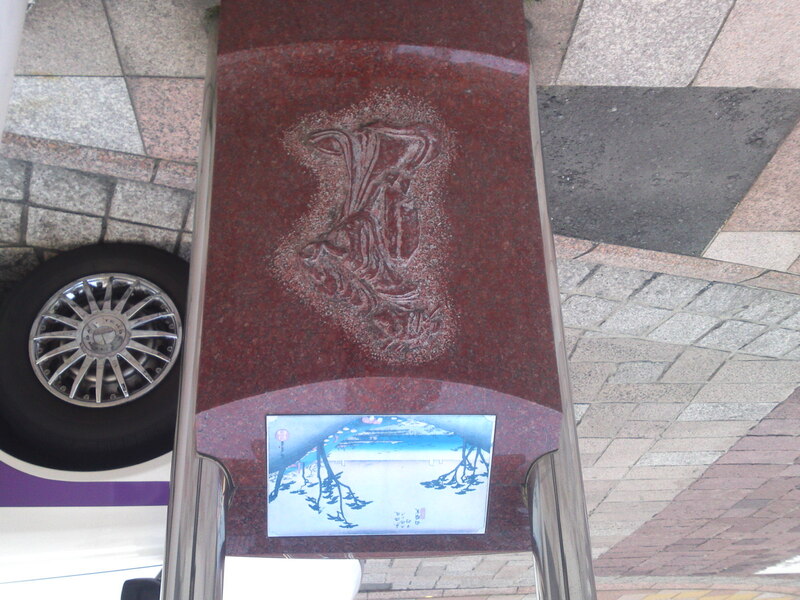 52nd Station: Kusatsu (Kusatsu City, Shiga Prefecture)! 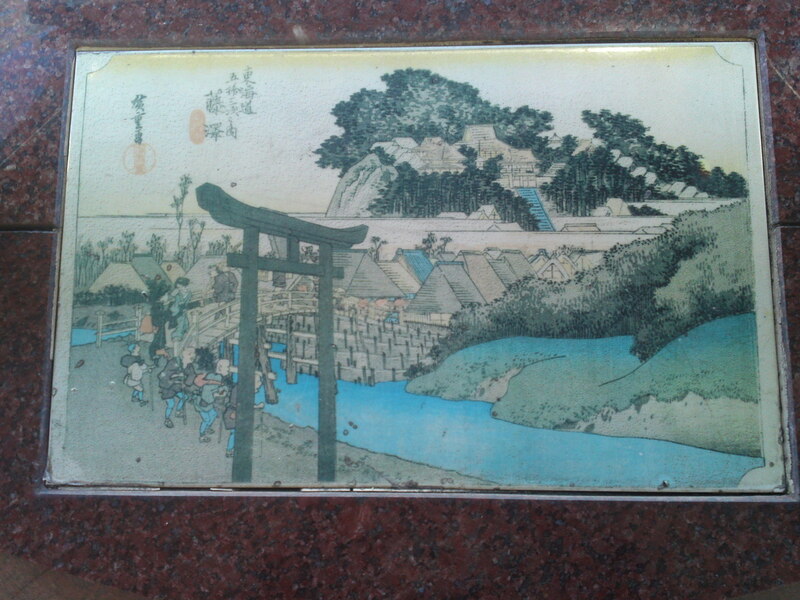 Sanjo Bridge at Keishi (Kyoto). 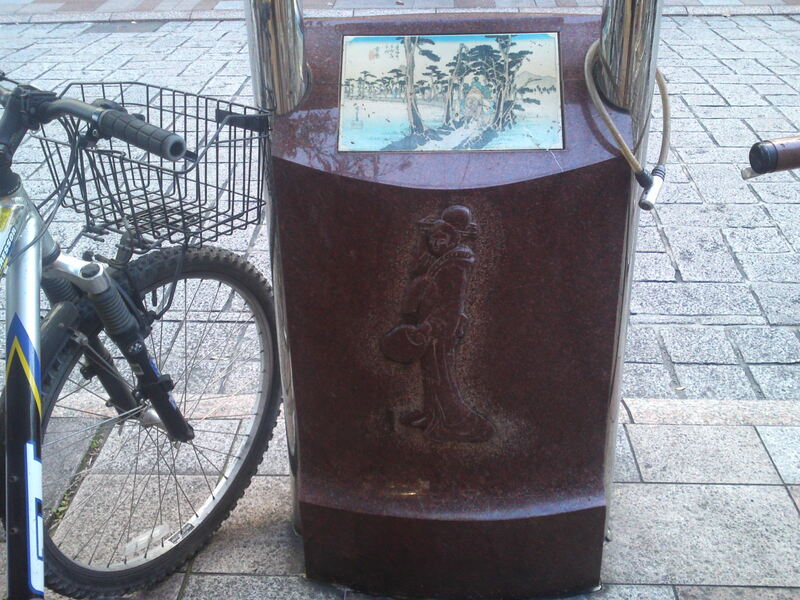 Not a station but the end of the Tokaido Trail! 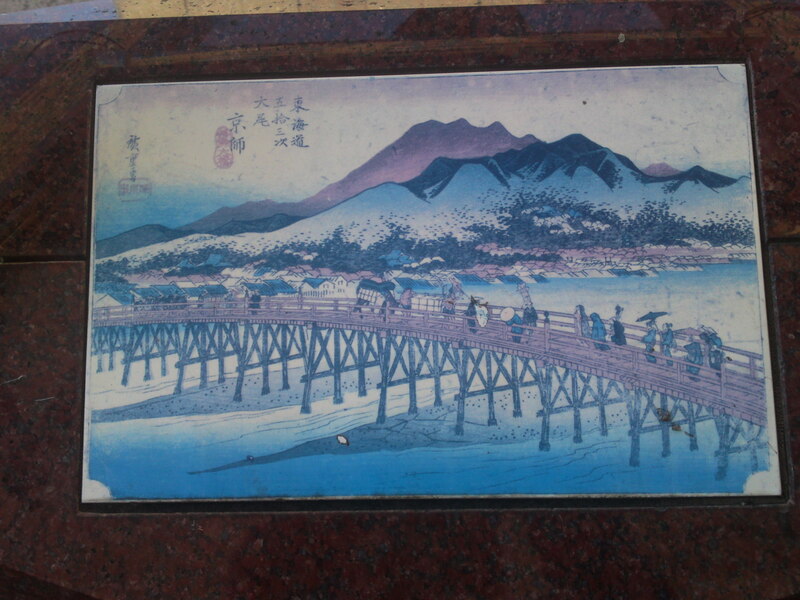 Although you can see all 53 wood block prints at the Hiroshige Museum in Yui, Shimizu Ku, Shizuoka City, did you know you can see 47 (at the last double check yesterday!) 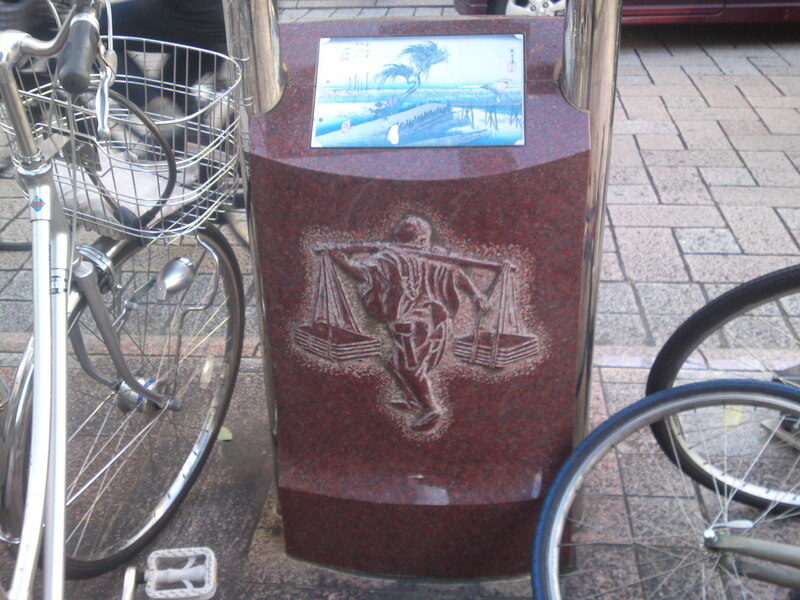 of them daily if you walk along Gofuku Cho Street? 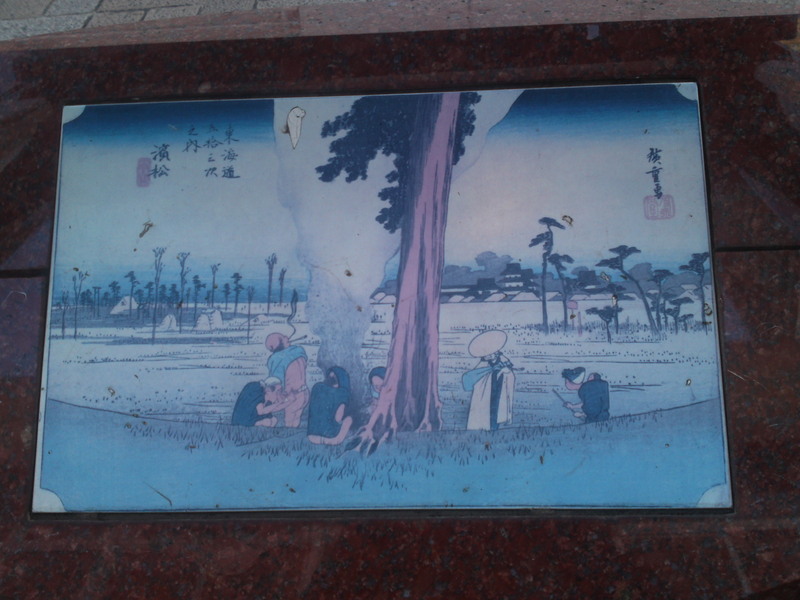 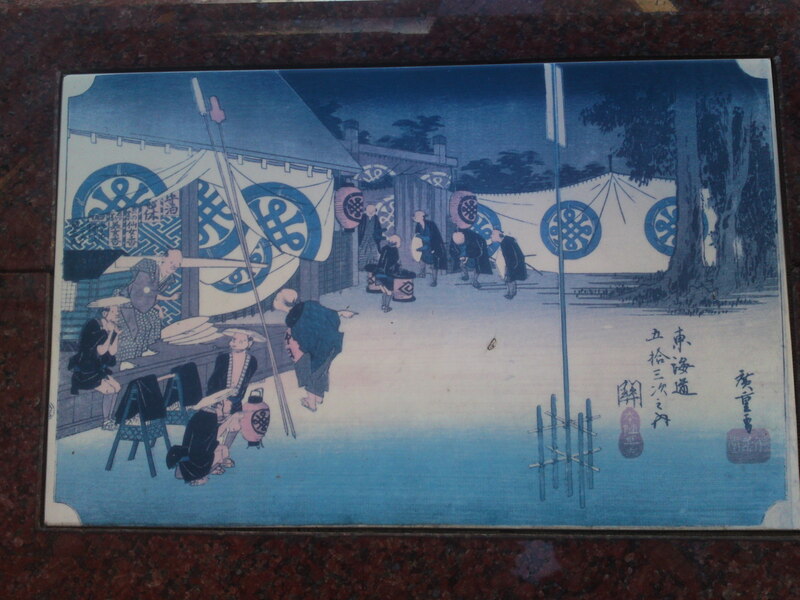 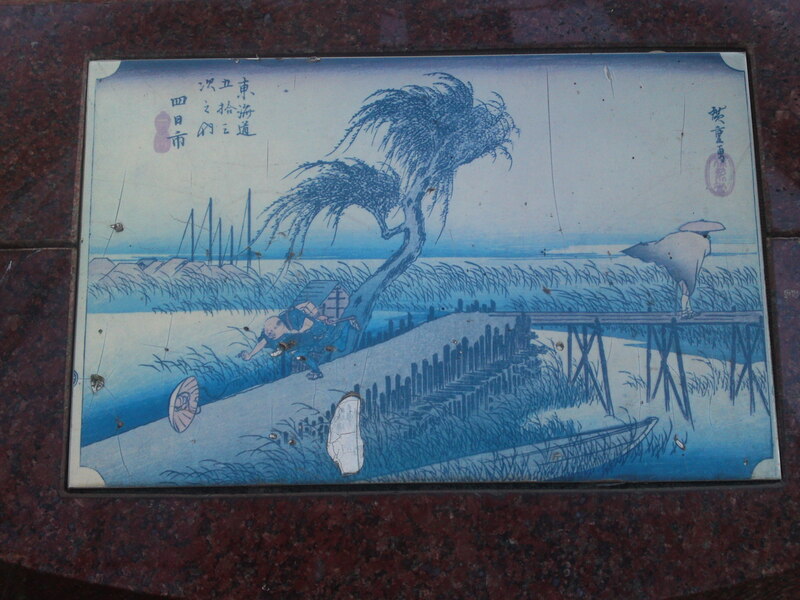 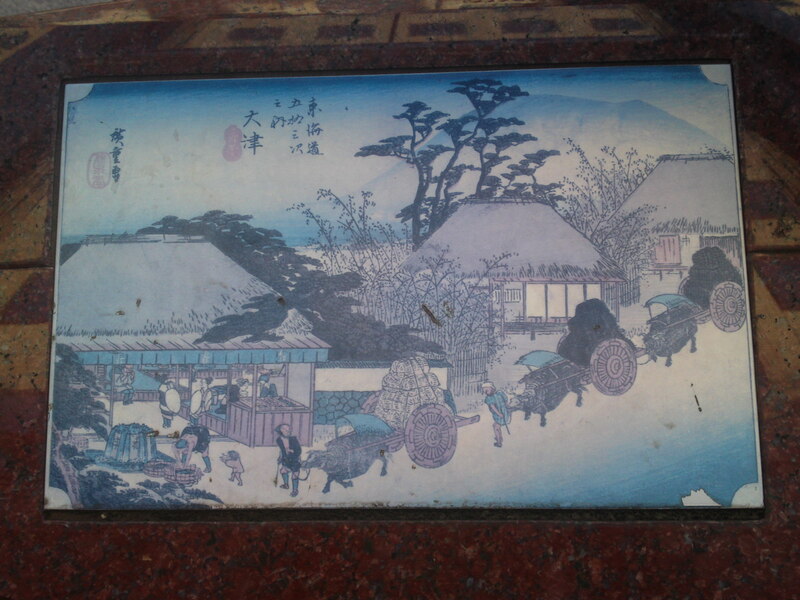 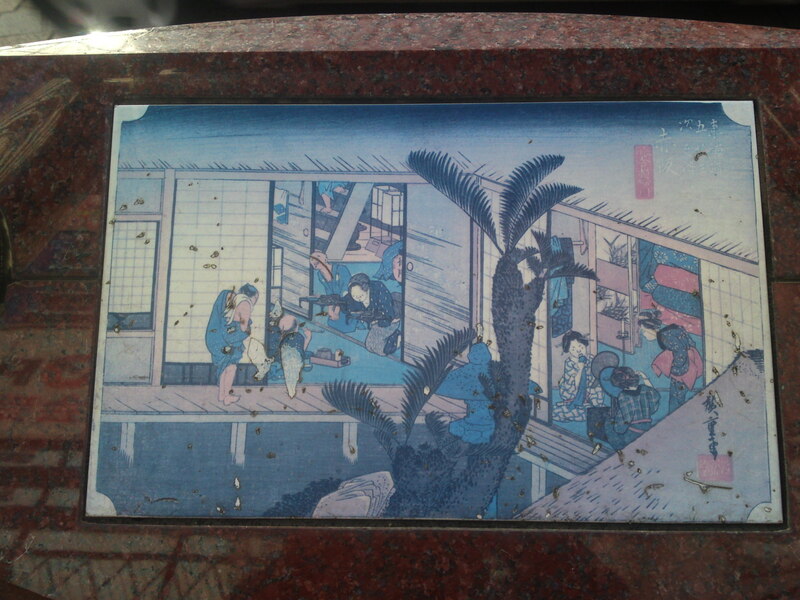 Actually, these ukiyo-e/Wood Block Prints by Hiroshige is only part of a whole city decoration concept including statues and benches made of similar material with Edo period “Characters”. 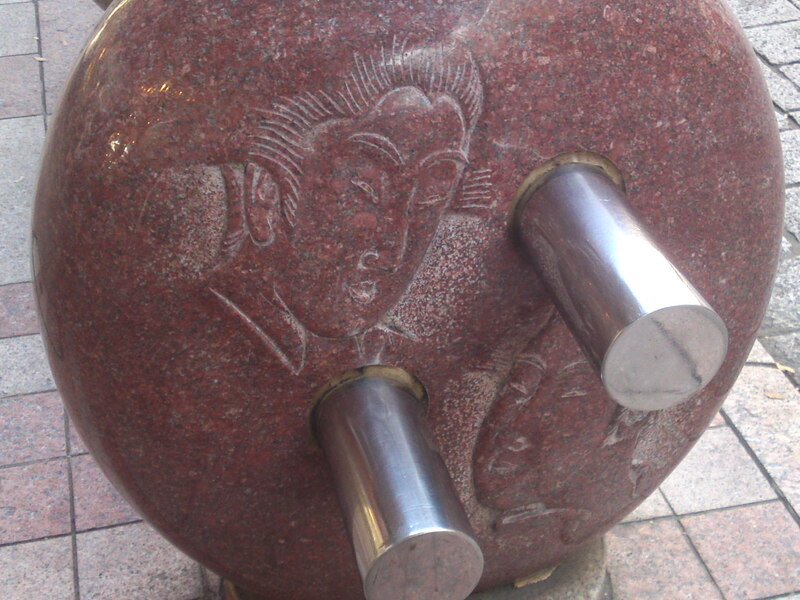 I found more for your interest yesterday! 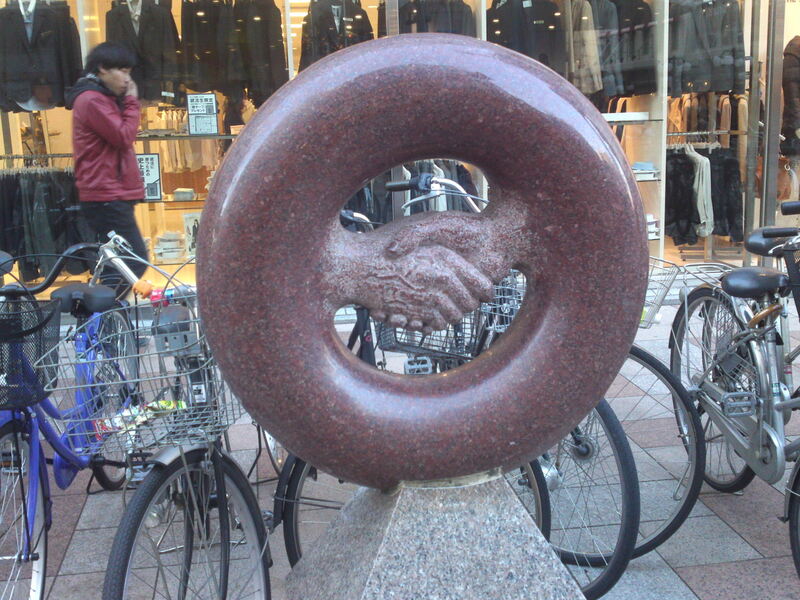 In Japan a full circle also means “peace” or “harmony”! 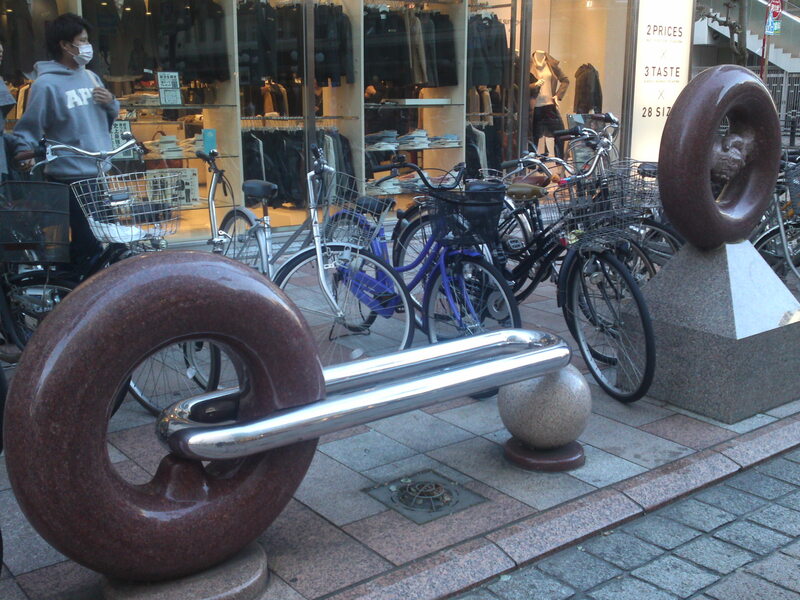 Thinking about it again the ring is probably supposed to roll along that contraption! 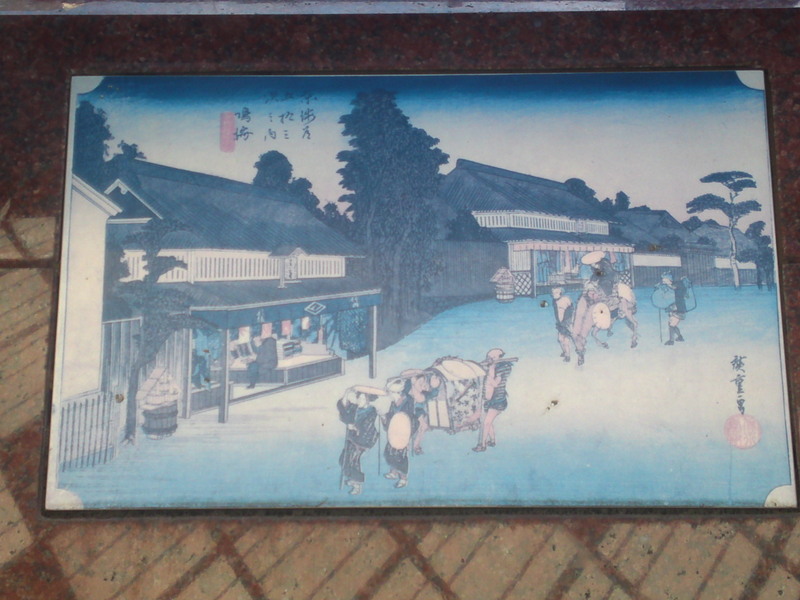 Alright, let’s go back again to the prints! 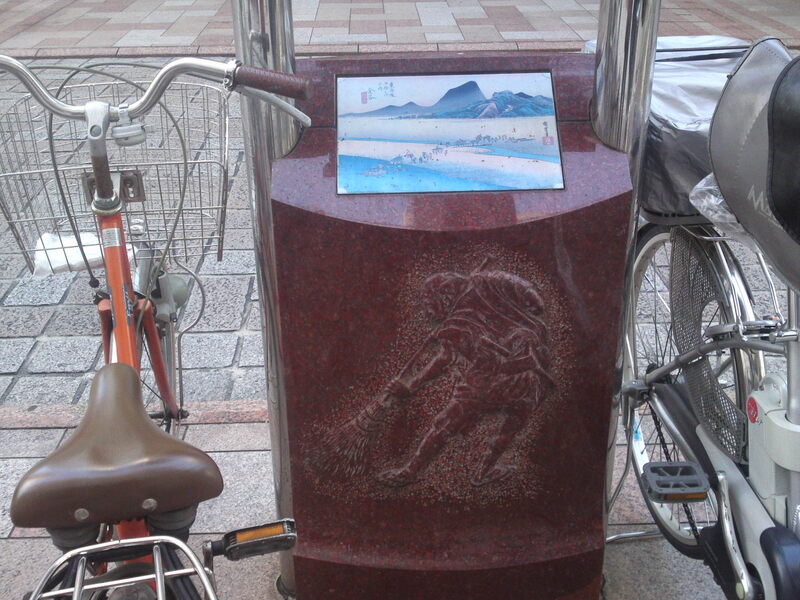 53rd Station: Otsu (presently, Otsu City, Shiga OPrefecture)! 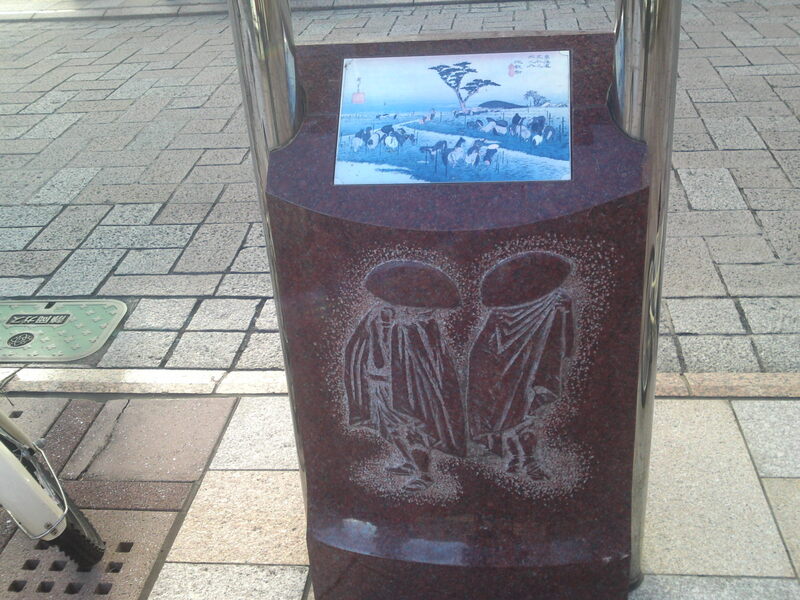 50th Station: Minakuchi (presently Koka City in Shiga Prefecture)! 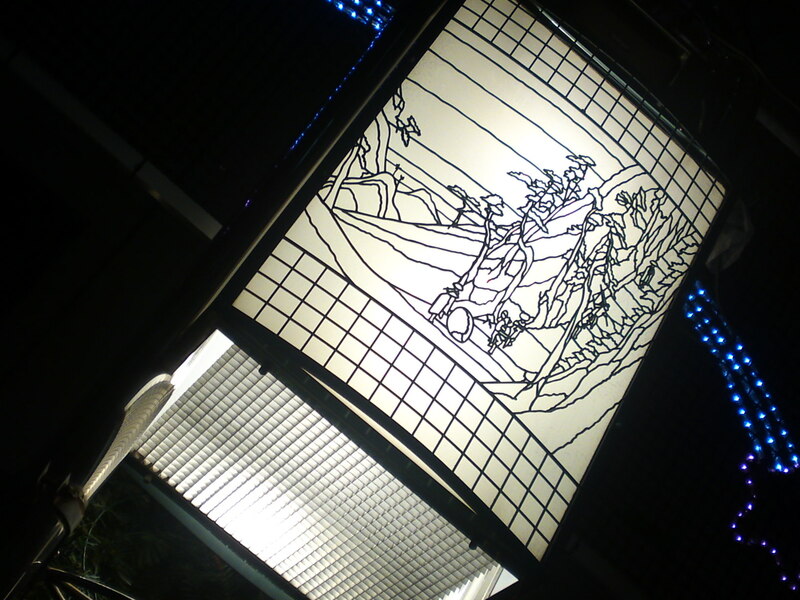 Traveler in the wind and rain! 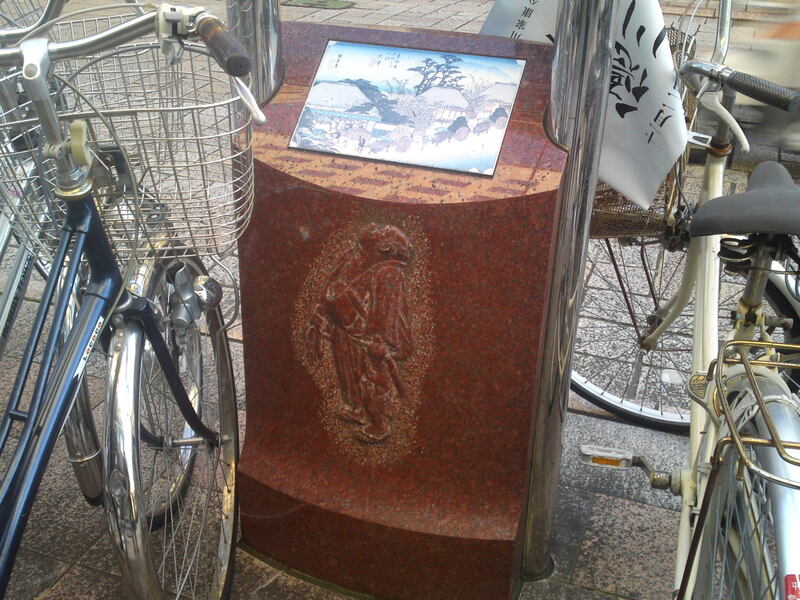 45th Station: Shono (presently part of Suzuka City, Mie Prefecture)! 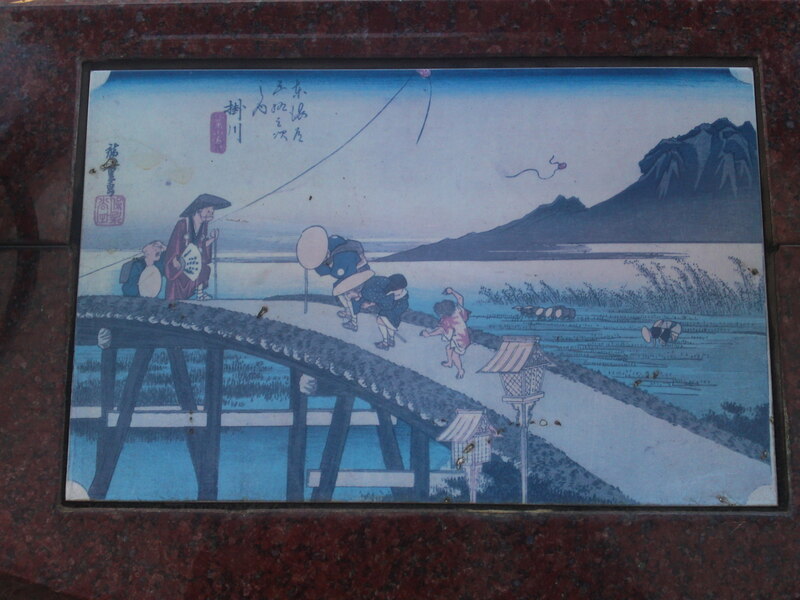 42nd Station: Kuwana (presently kuwana City, Mie Prefecture)! 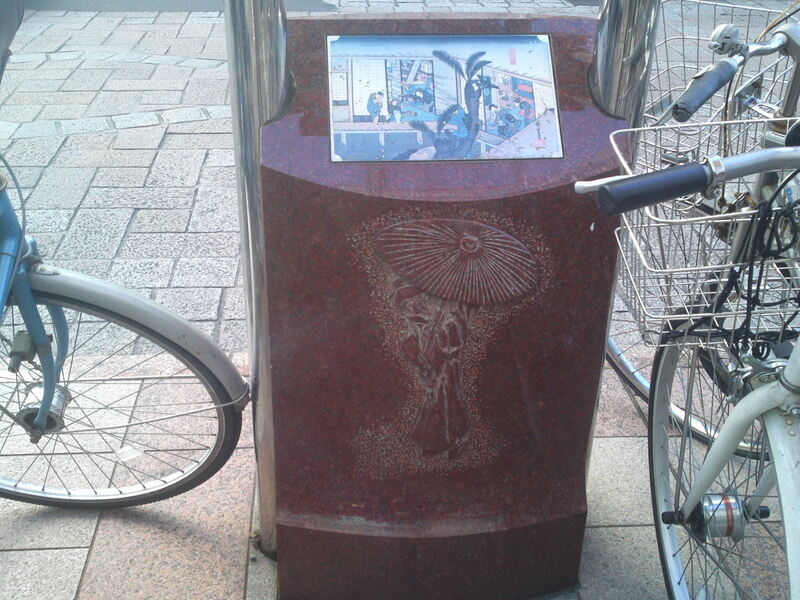 40th Station: Narumi (presently part of Midori Ku, Nagoya City, Aichi Prefecture)! 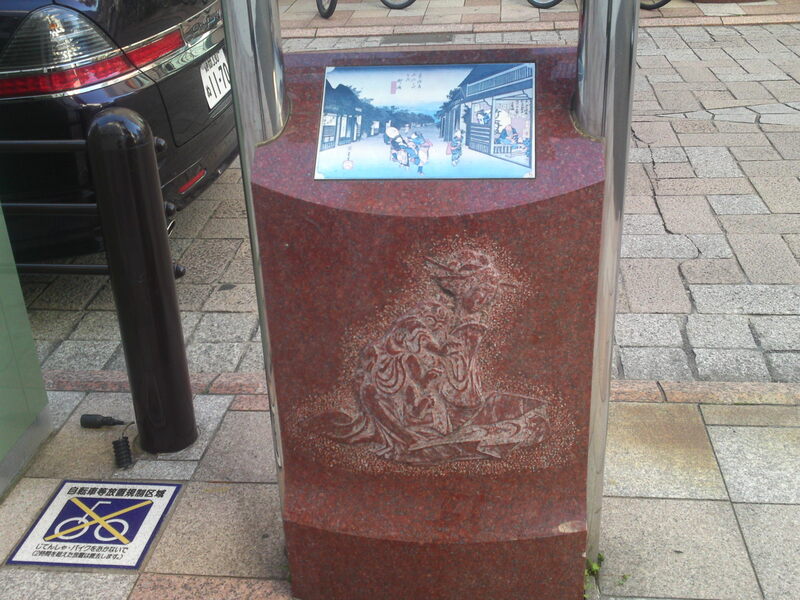 38th Station: Okazaki (presently Okazaki City, Aichi Prefecture)! 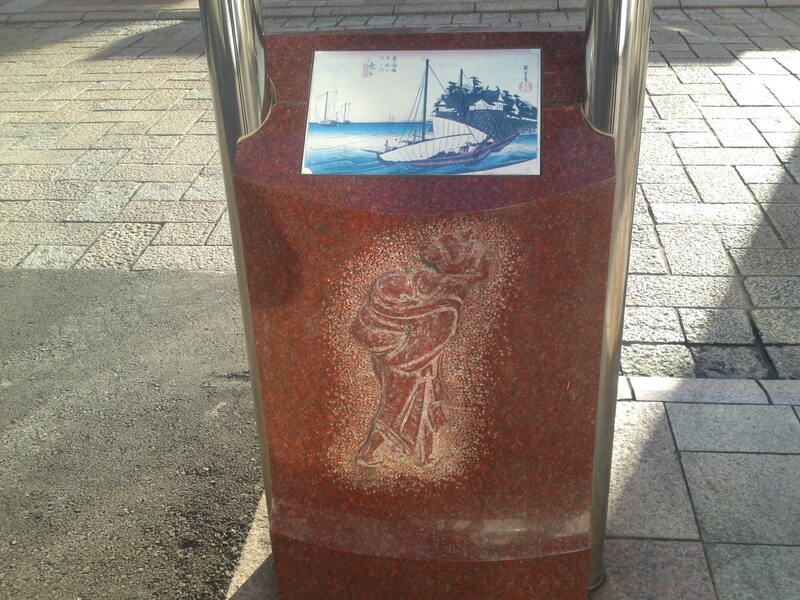 35th Station: Goyu (presently port of Toyokawa City, Aichi Prefecture)! 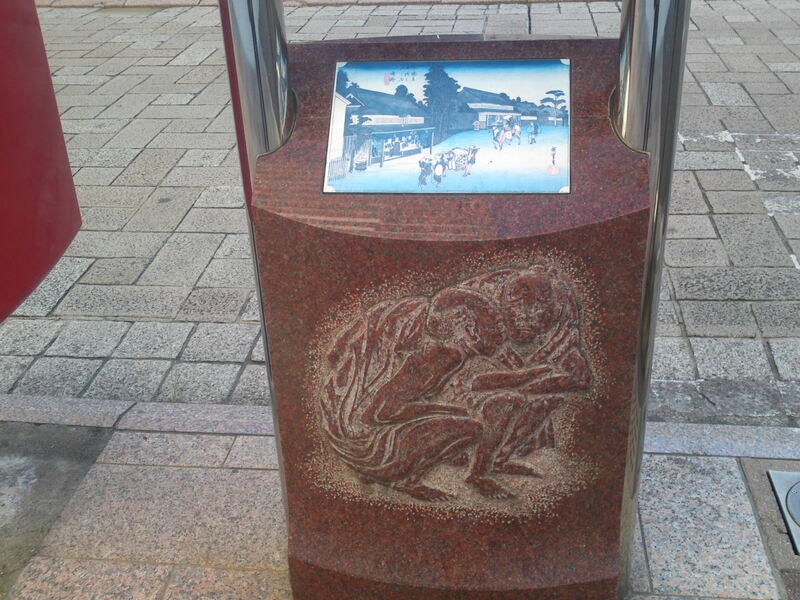 32nd Station: Shirasuka (presently in Kosai City, Shizuoka Prefecture)! 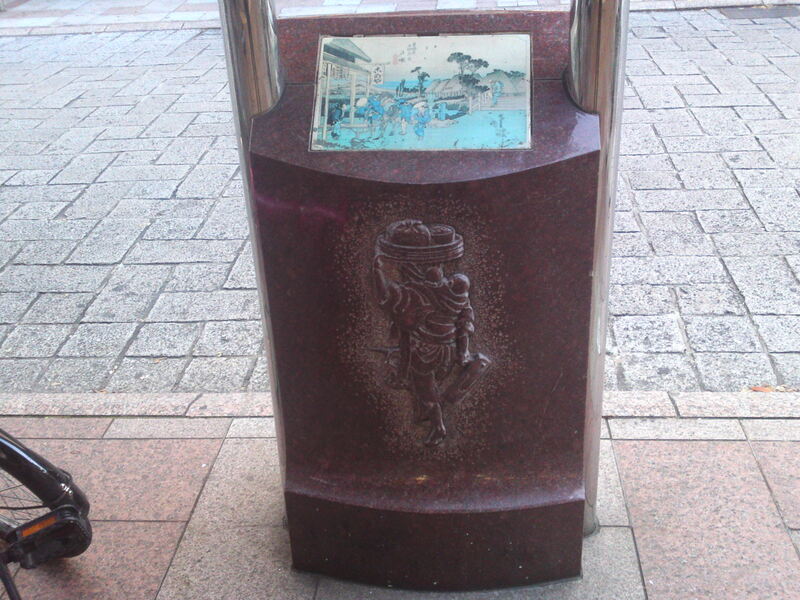 Hamamatsu (Hamamatsu City, Shizuoka Prefecture)! 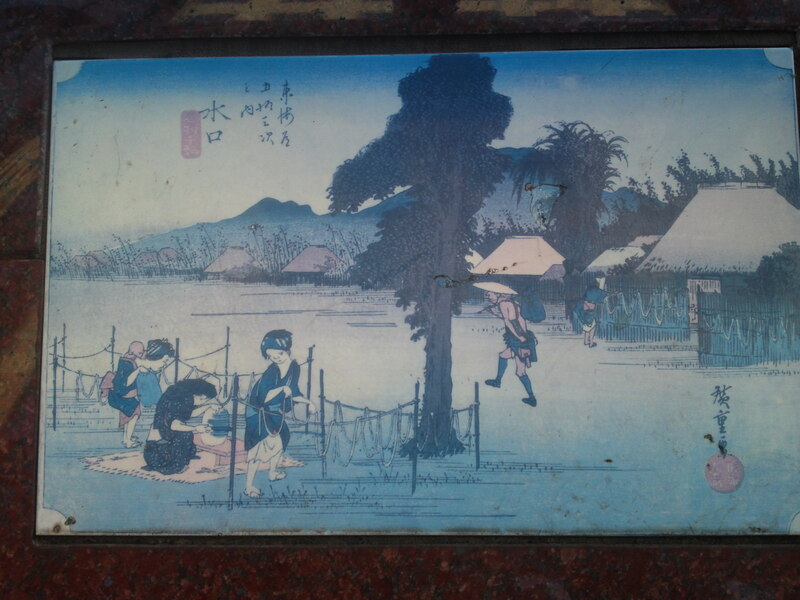 Although you can see all 53 wood block prints at the Hiroshige Museum in Yui, Shimizu Ku, Shizuoka City, did you know you can see 45 (at the final check today!) 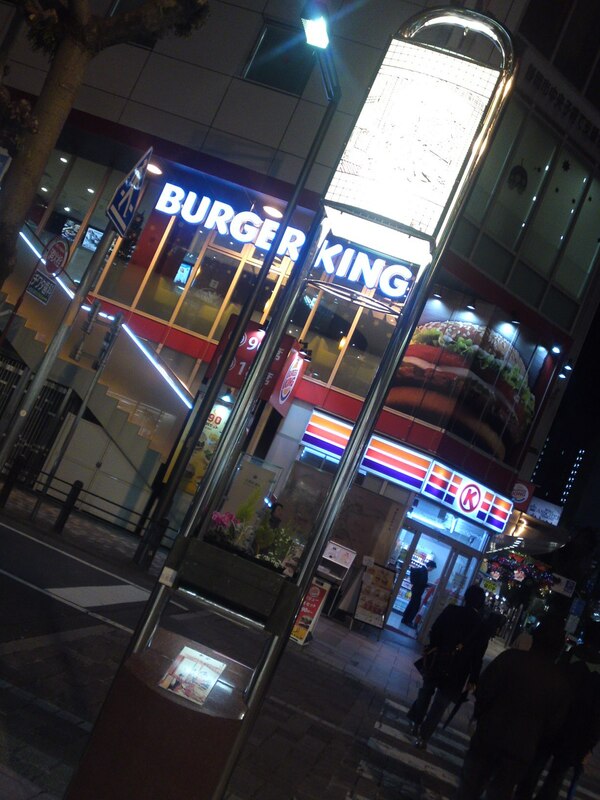 of them daily if you walk along Gofuku Cho Street? 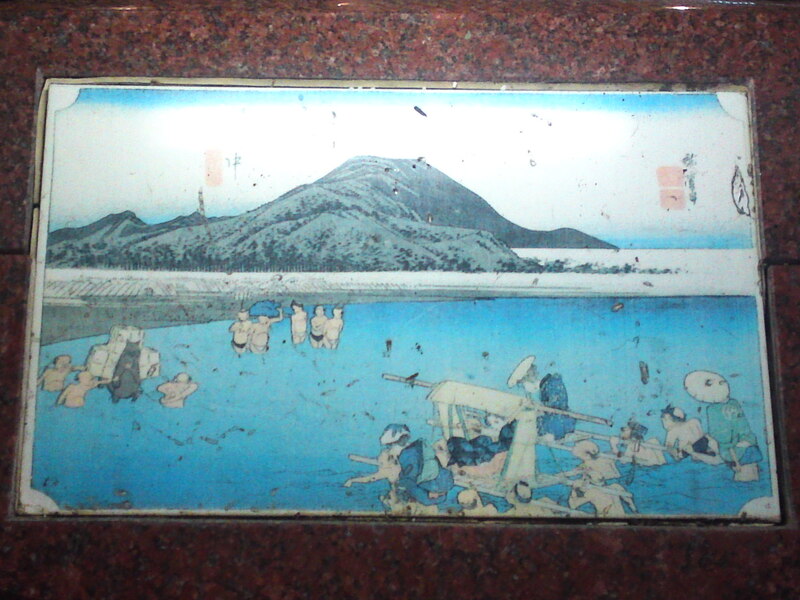 I’m preparing a total compilation of the ukiyo-e only, including the ones missing, that is a total of 53+2= 57! 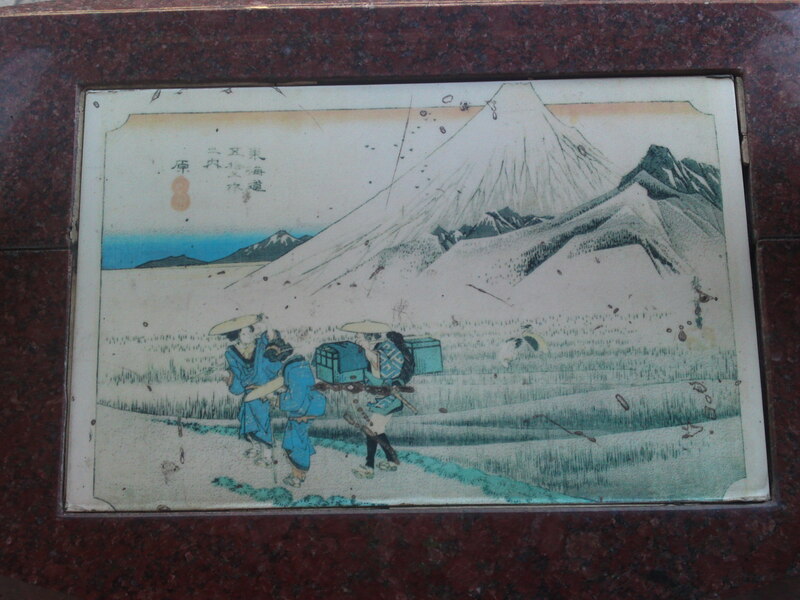 Before I proceed with the last ukiyo-e of this series I want to show you a few more pictures of art works created with them! 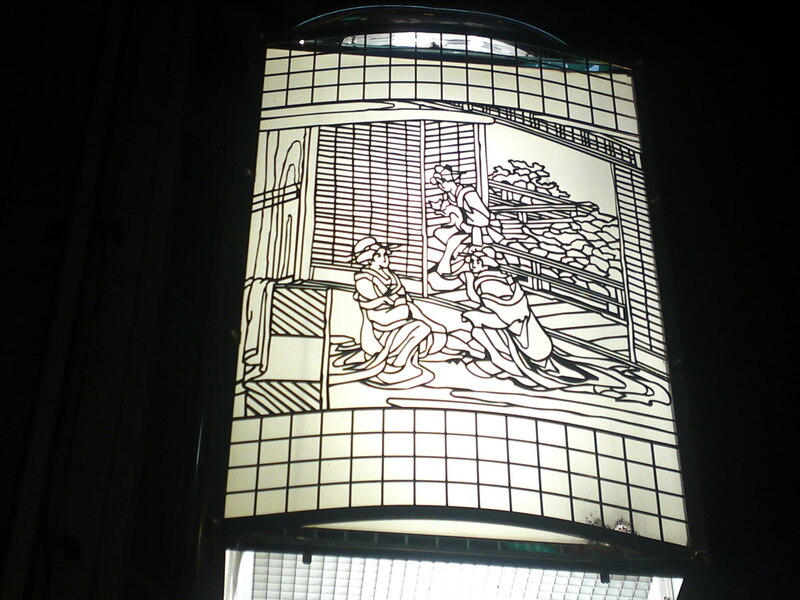 Gofuku Cho Street Sign at the entrance of Gofuku Cho Street! 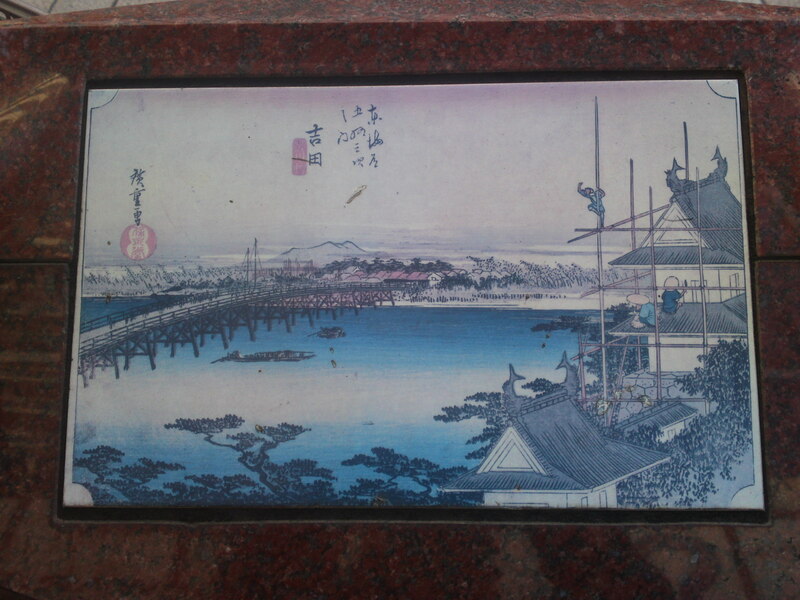 Alright, let’s proceed to the pedestals and wood block prints! 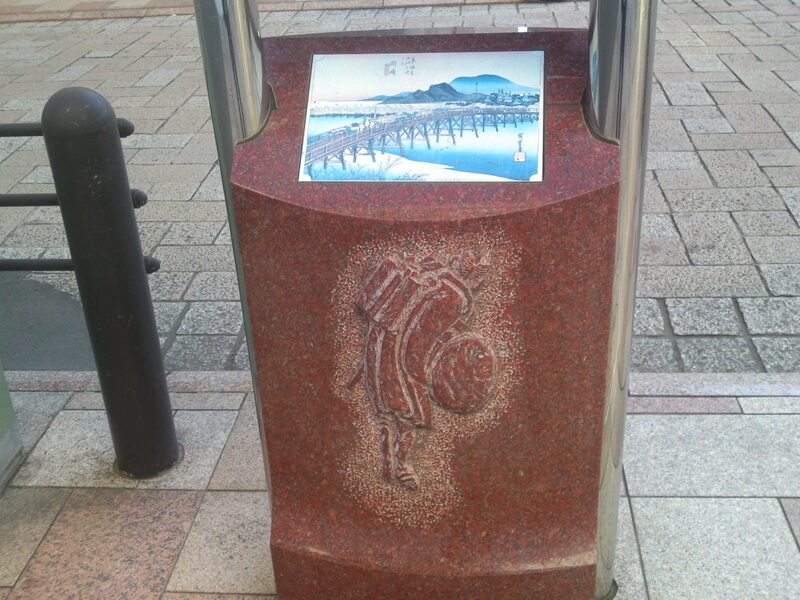 27th Station: Fukuroi (Fukuroi City, Shizuoka Prefecture)! 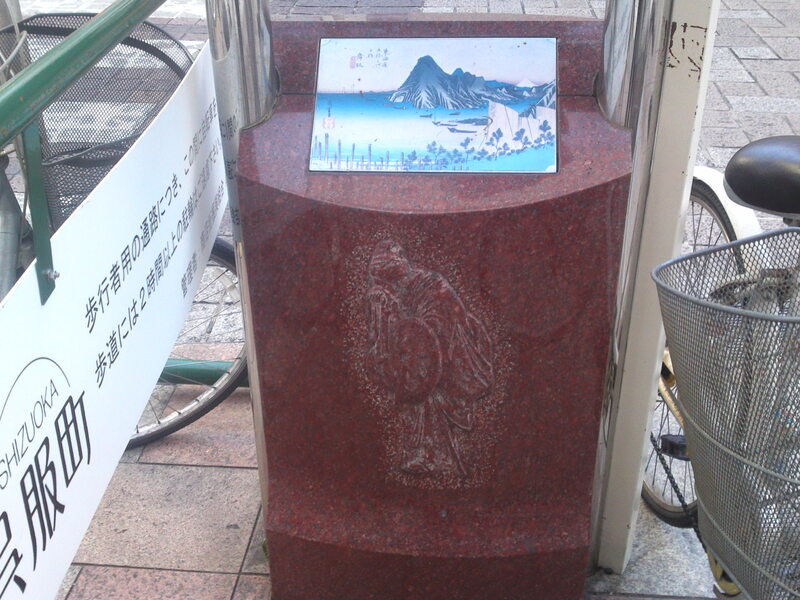 25th Station: Nissaka (presently in Kakekagawa City, Shizuoka Prefecture)! 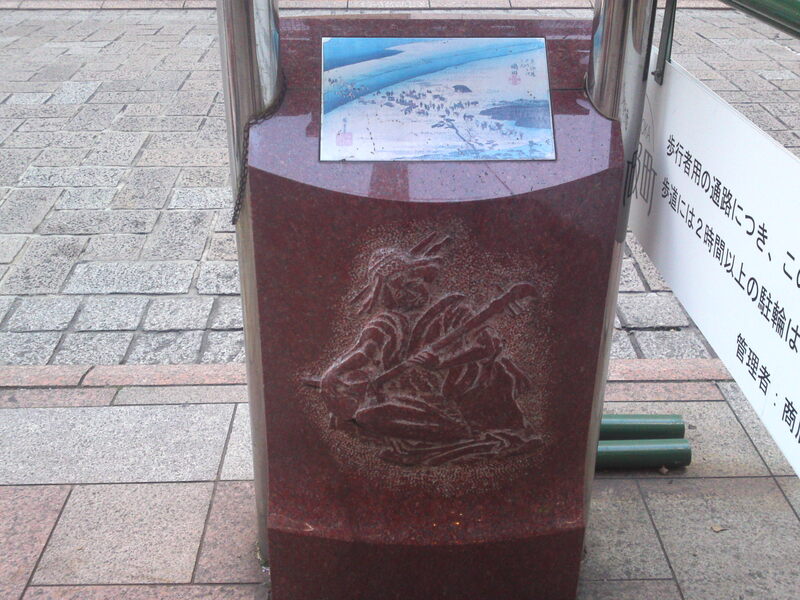 23rd Station: Shimada (Shimada City, Shizuoka Prefecture)! 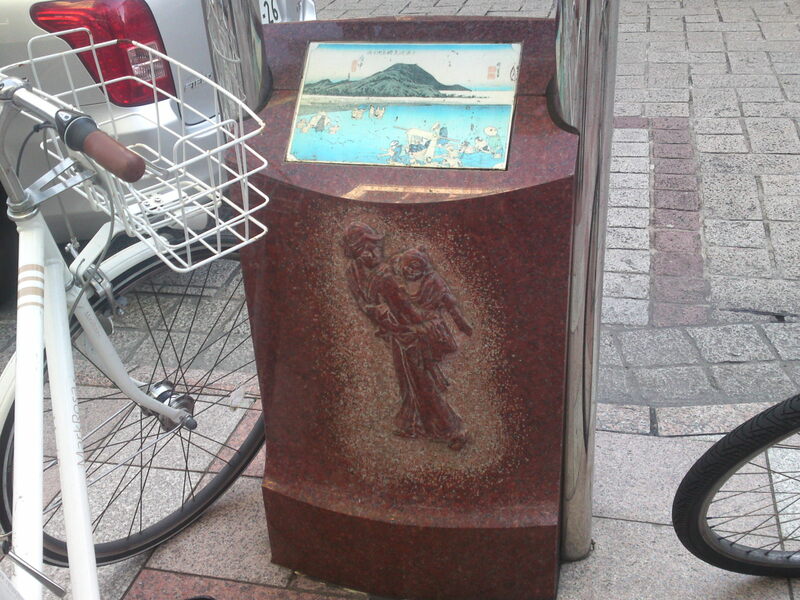 Mother Carrying Child on her Back! 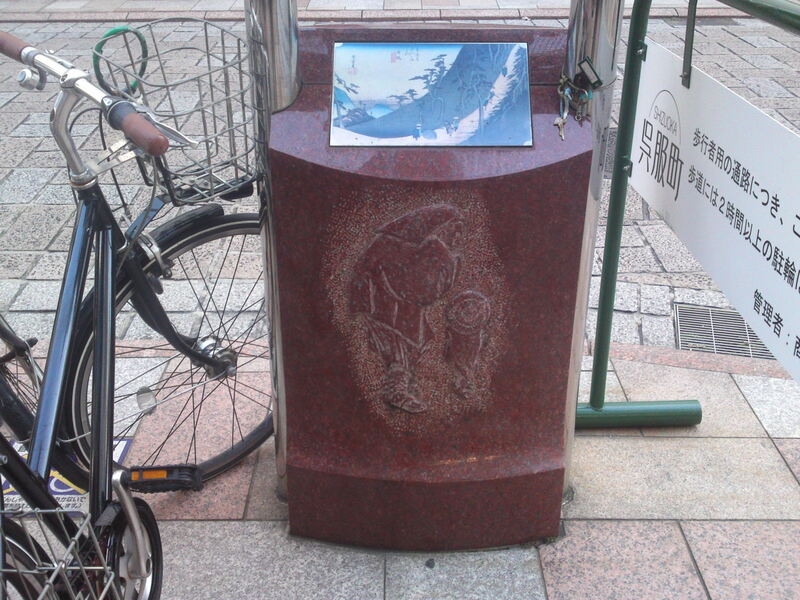 21st Station: Okabe (presently in Fujieda City, Shizuoka Prefecture)! 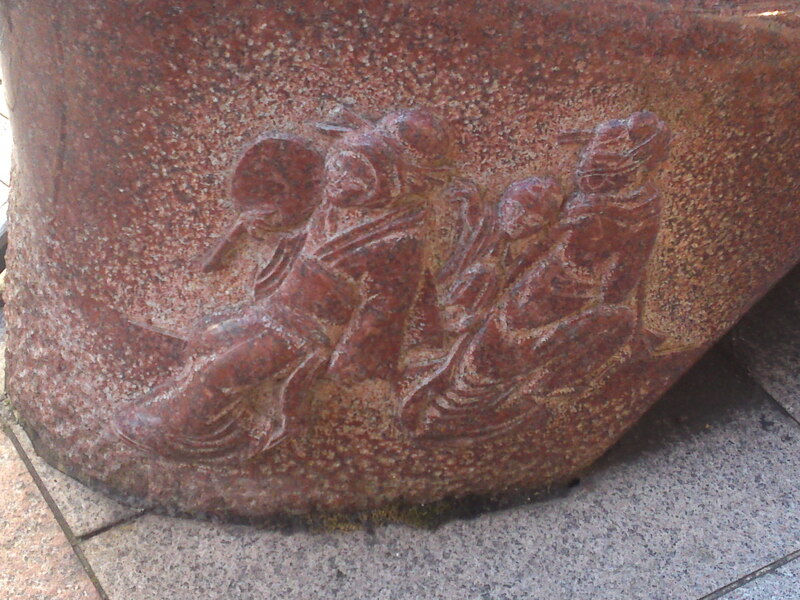 Mother Carrying her Son on her Back! 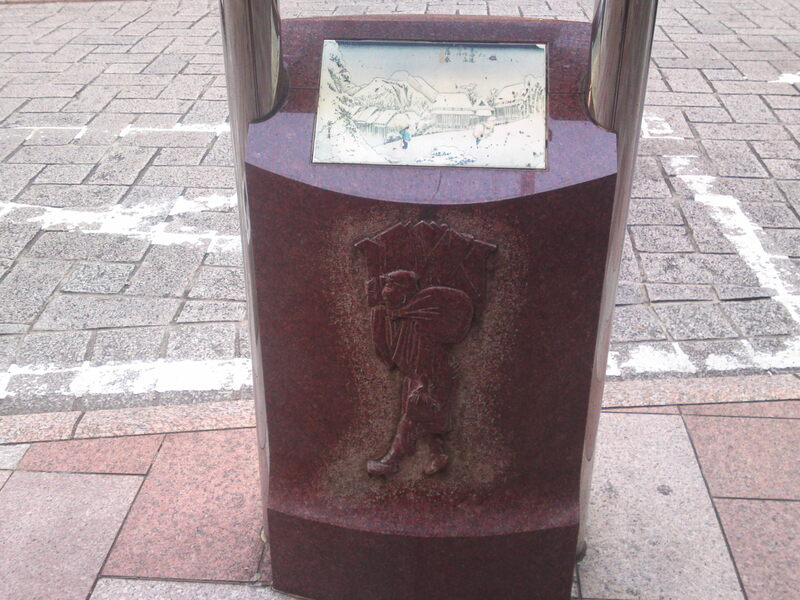 19th Station: Fuchu (presently Shizuoka City)! 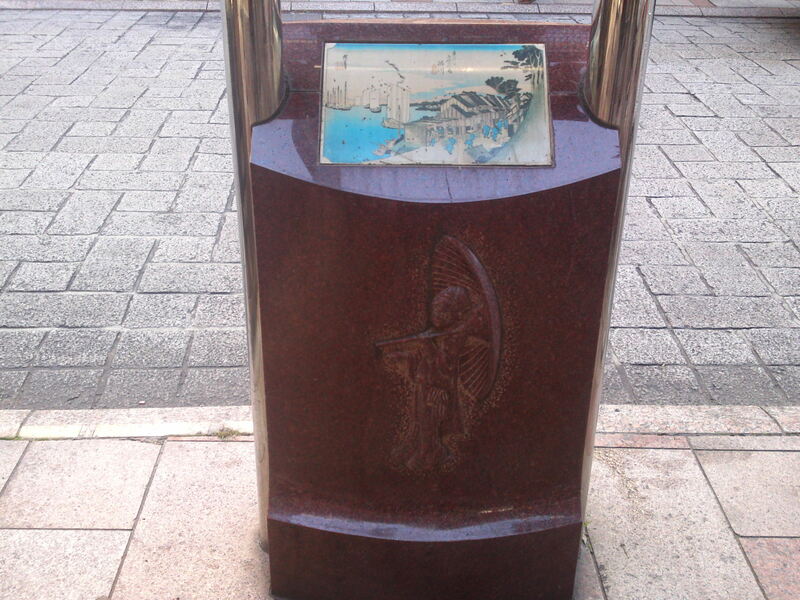 Two-Sword Samurai in the Wind! 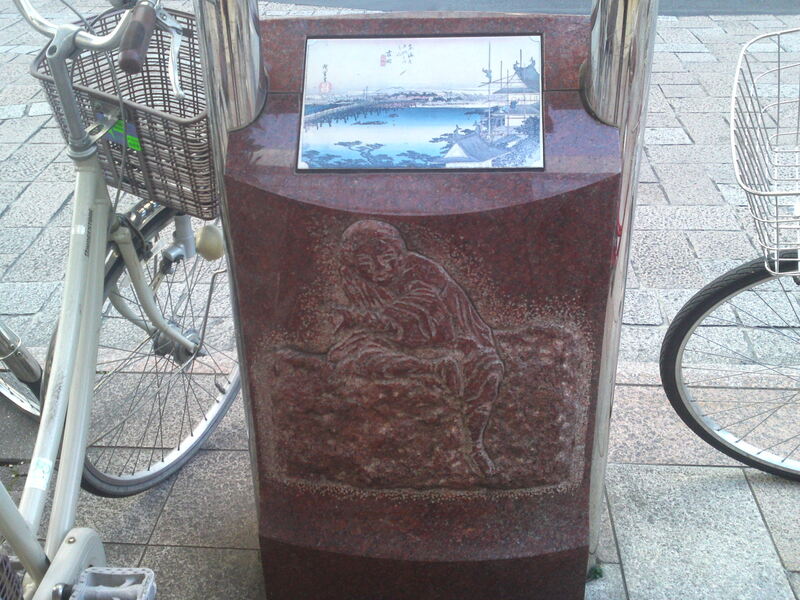 17th Station: Okitsu (presently in Shimizu Ku, Shizuoka City)! 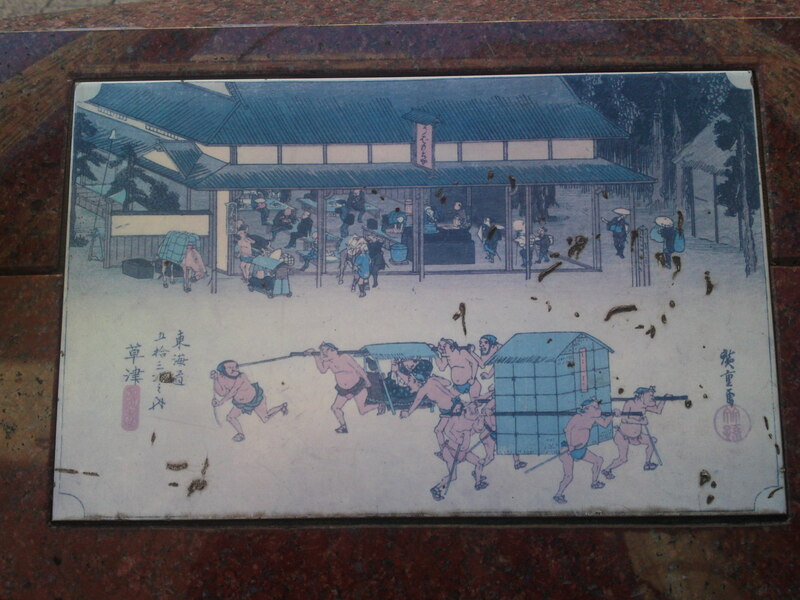 10th Station: Hakone (Hakone, Kanagawa prefecture)! 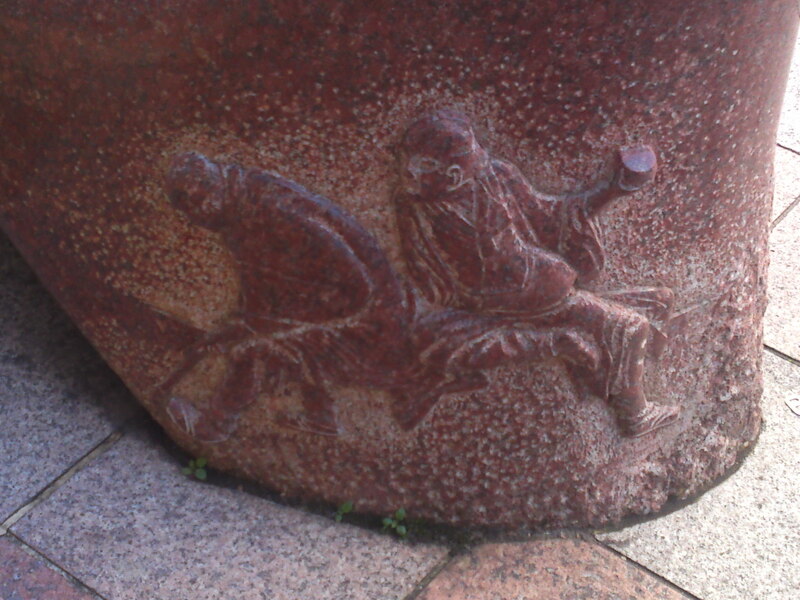 Farmer’s Wife Carrying Produce on her Head and Son on her back! 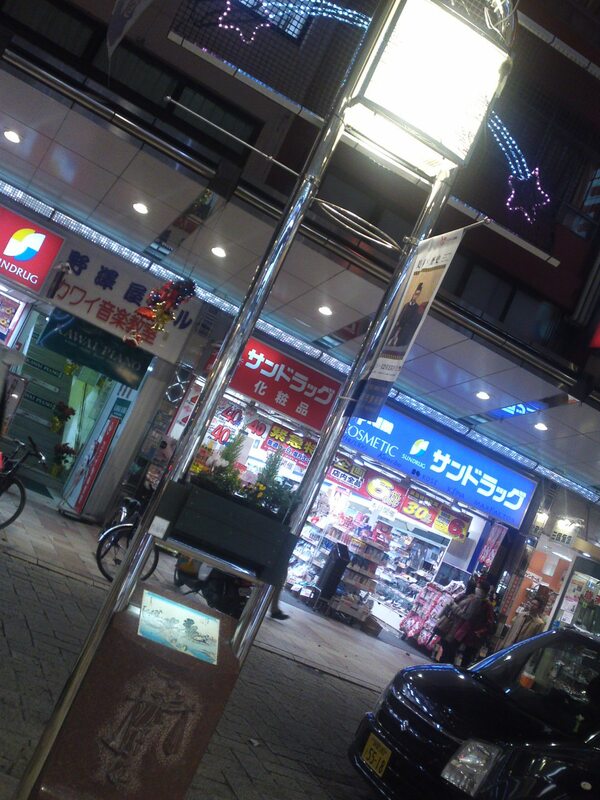 5th Station: Totsuka (presently Totsuka Ku, Yokohamam City, Kanagawa Prefecture)! 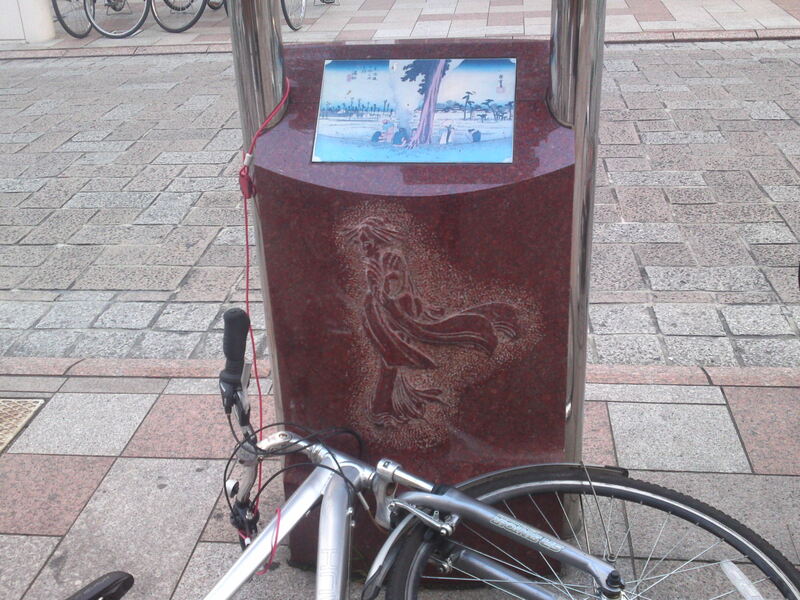 2nd Station: Kawasaki (Kawasaki City, Kanagawa Prefecture)! 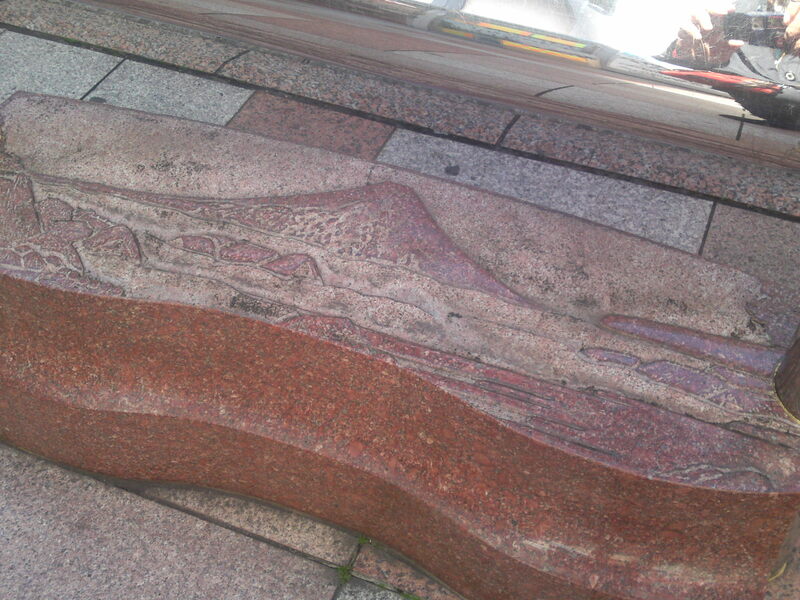 Resting Mother and Two Children! 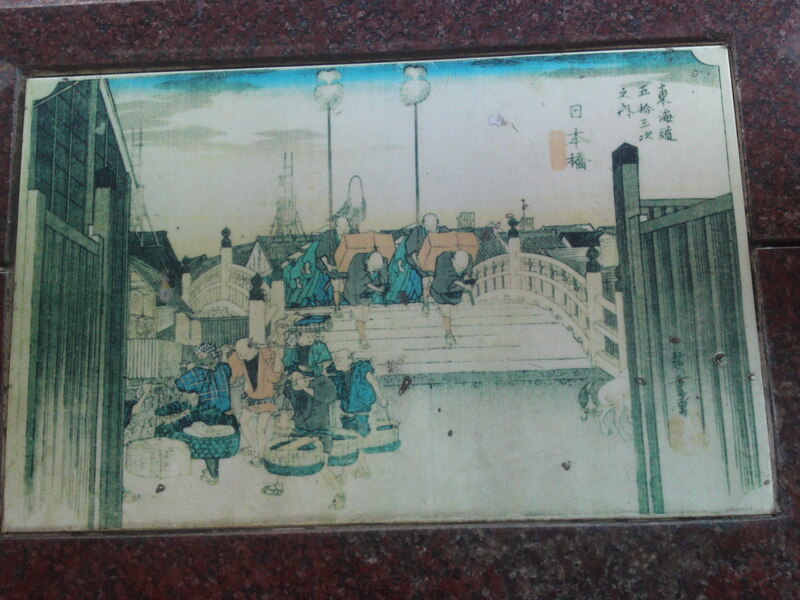 Not a Station but the starting point at Nihonbashi, The Bridge o Japan in Edo (presently Tokyo)! 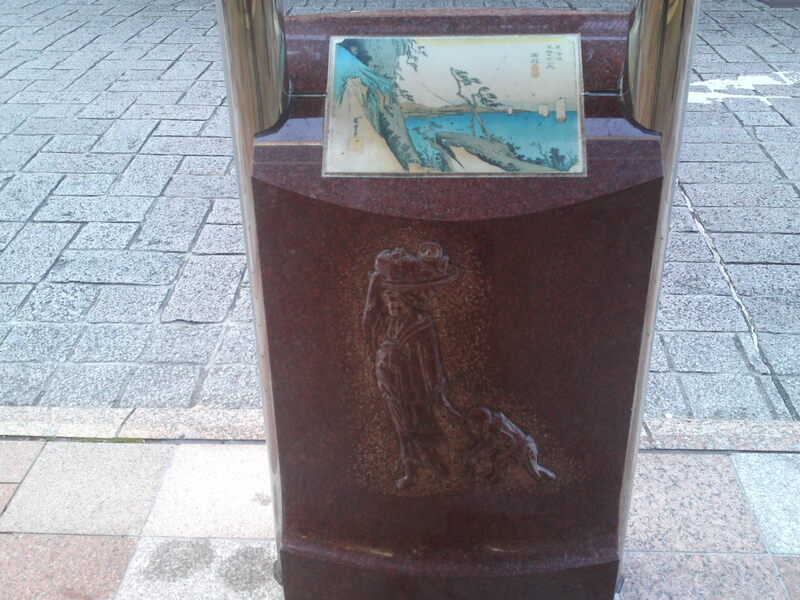 1st Station: Shinagawa (presently in Tokyo)! 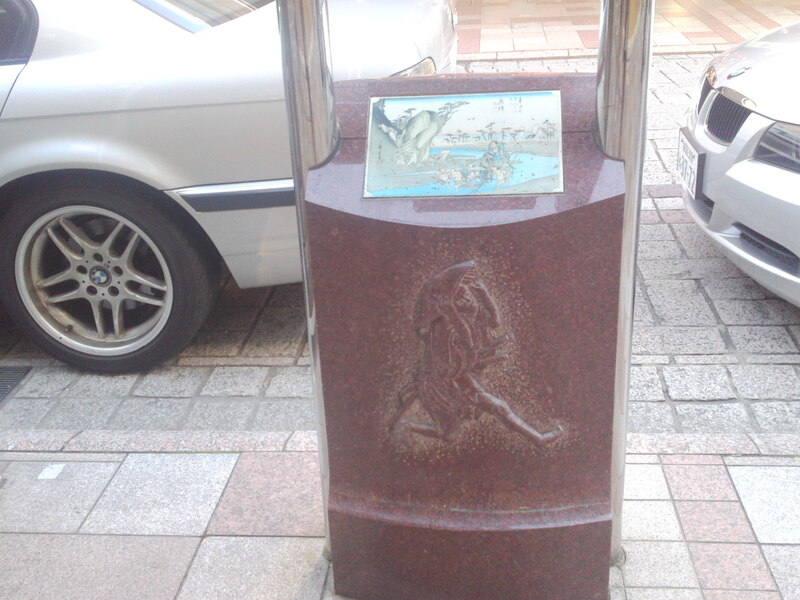 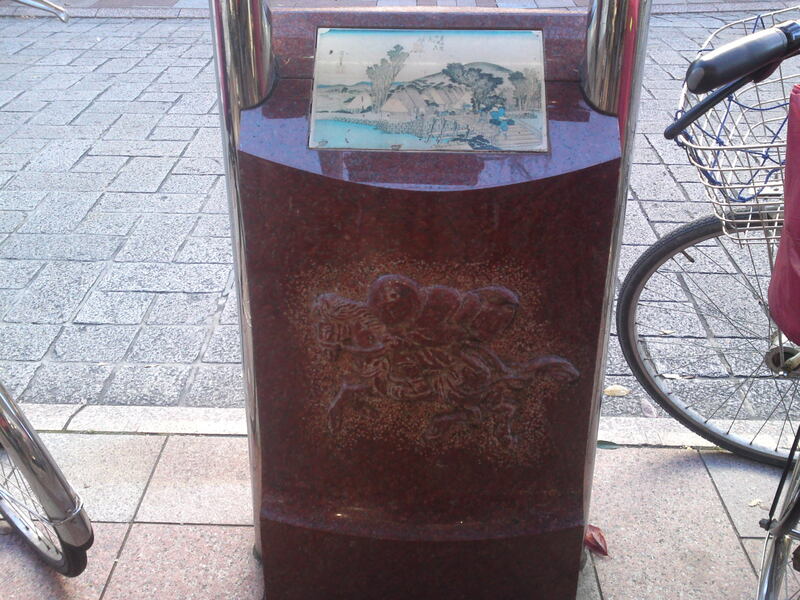 4th Station: Hodogaya (presently Hodogaya Ku, Yokohama City, Kanagawa Prefecture)! 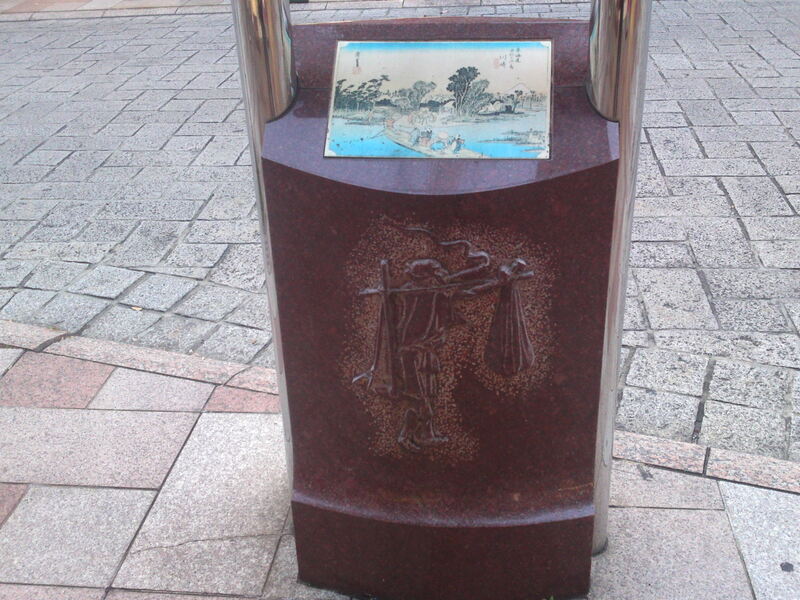 Mother Carrying Child on her Back under Unbrella! 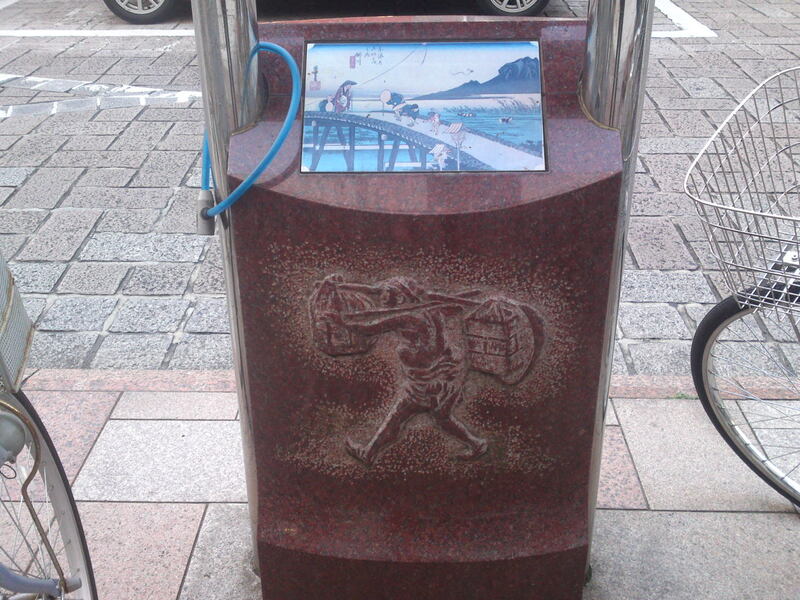 6th Station: Fujisawa (Fujisawa City, Kanagawa Prefecture)! 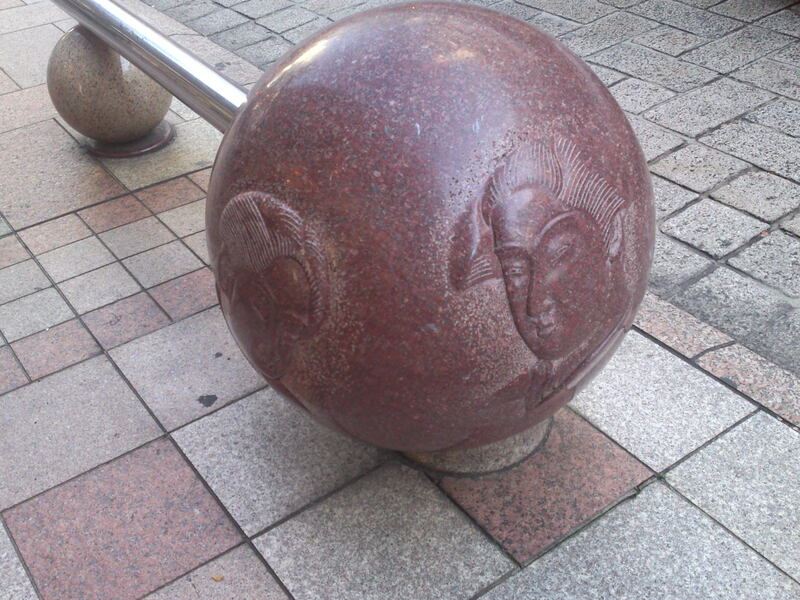 Mother and Grandmother Playing with Child! 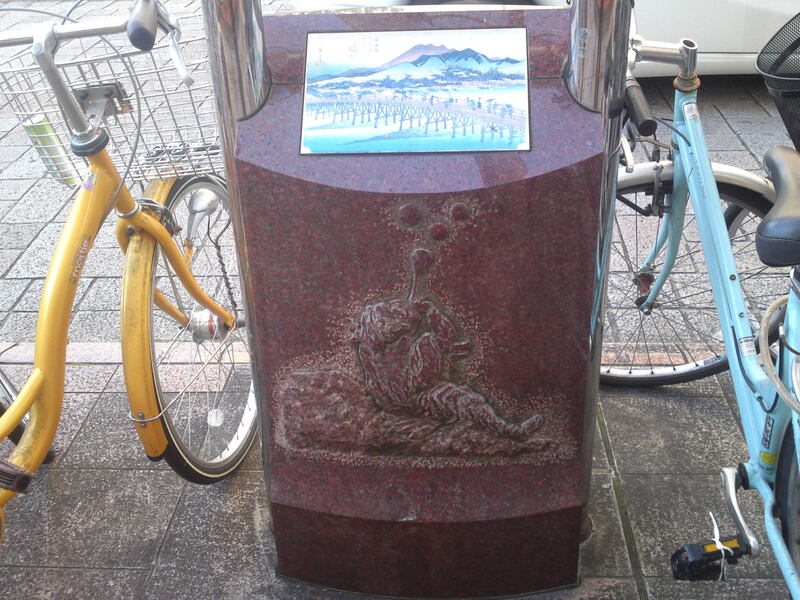 11th Station: Mishiima (Mishima City, Shizuoka Prefecture)! 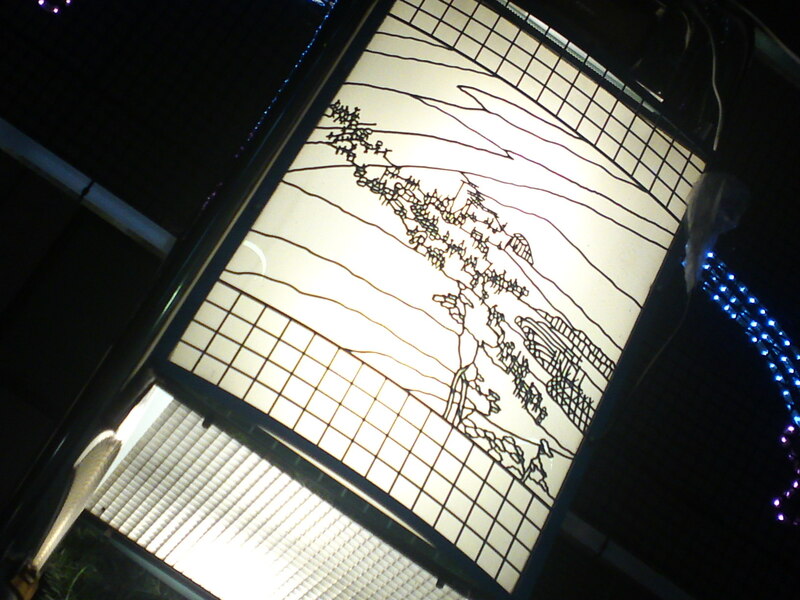 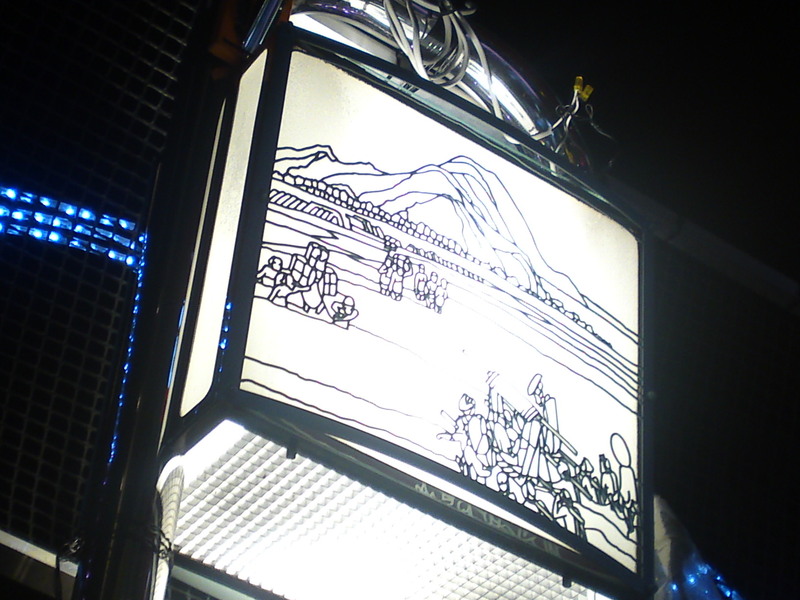 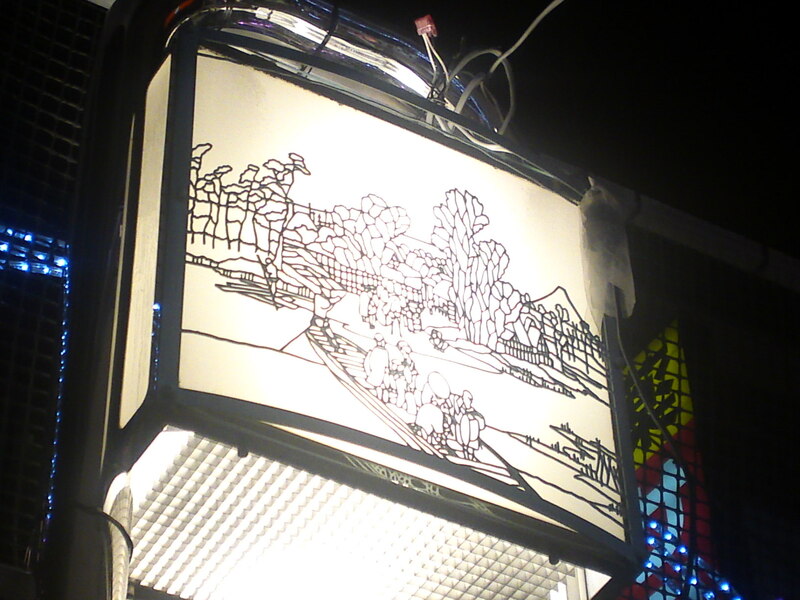 Hiroshige Illuminations in Gofuku Street in Shizuoka City! 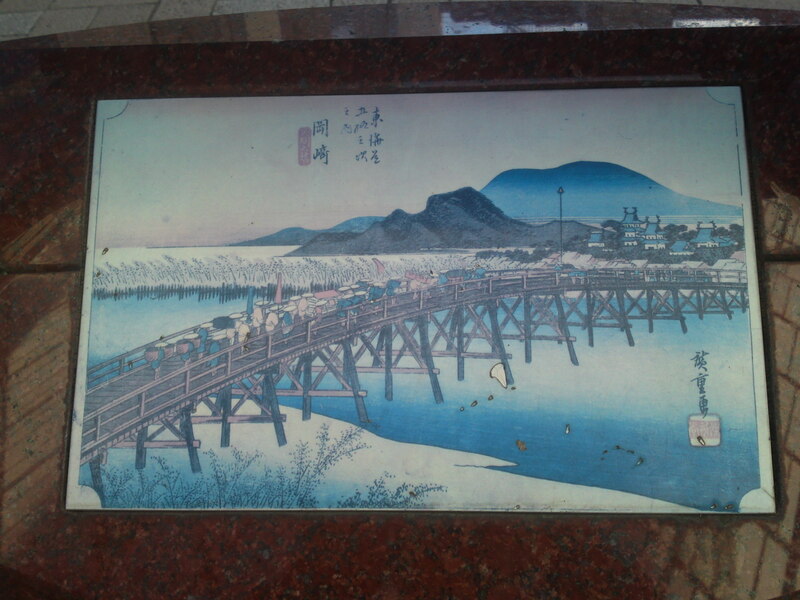 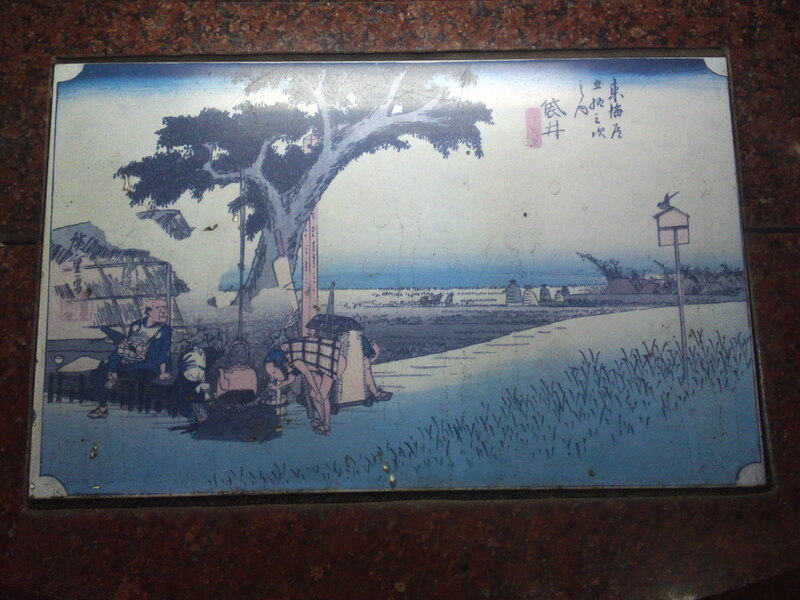 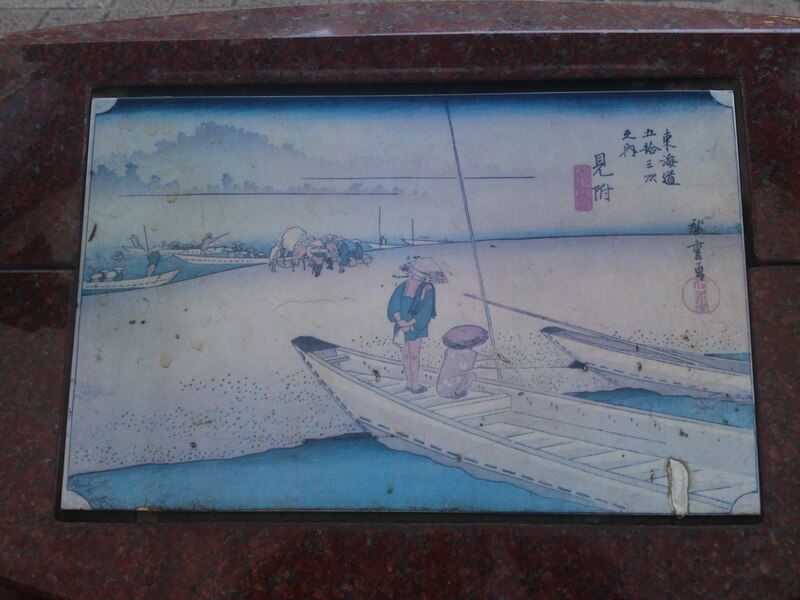 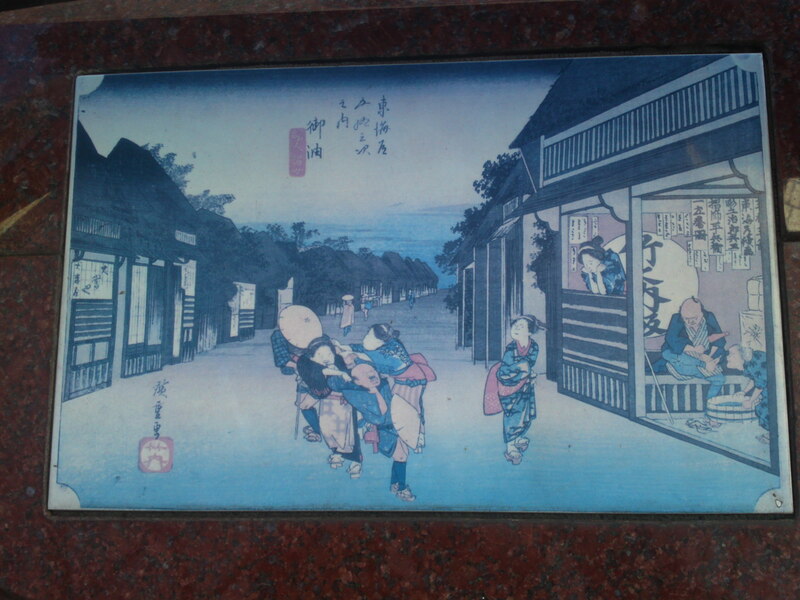 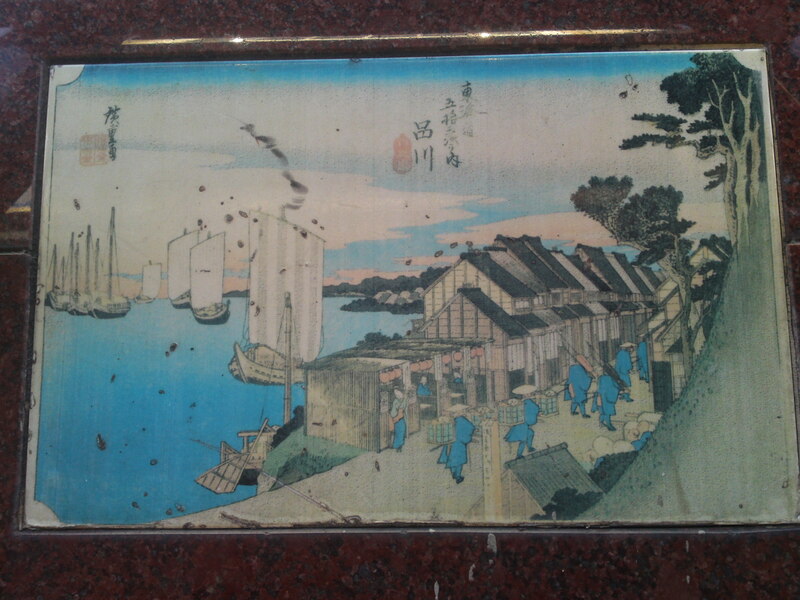 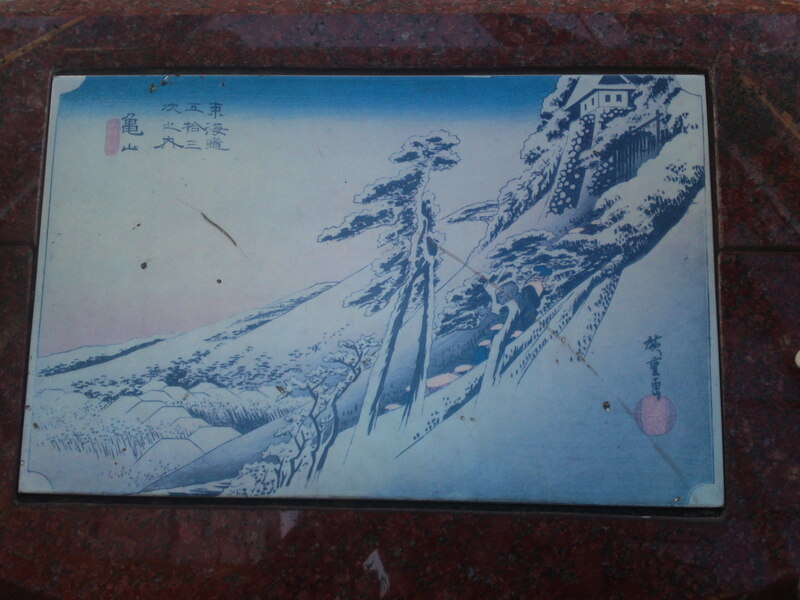 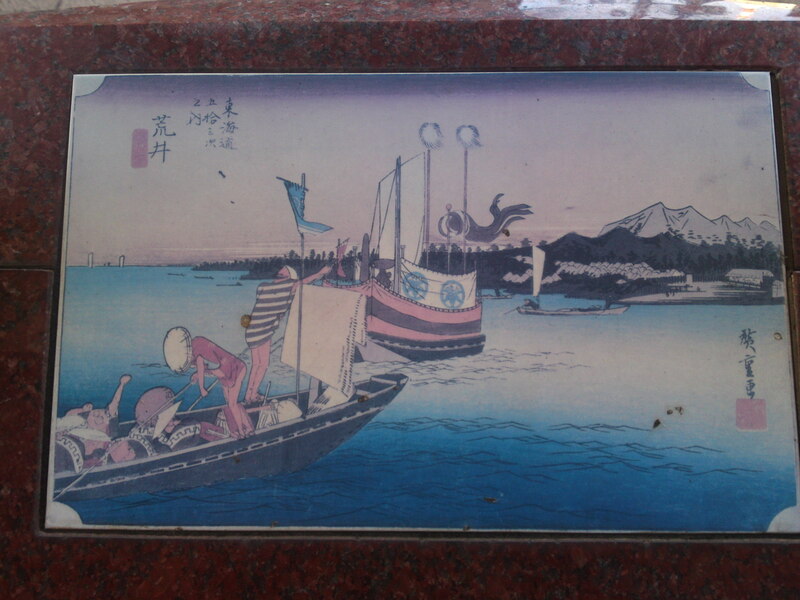 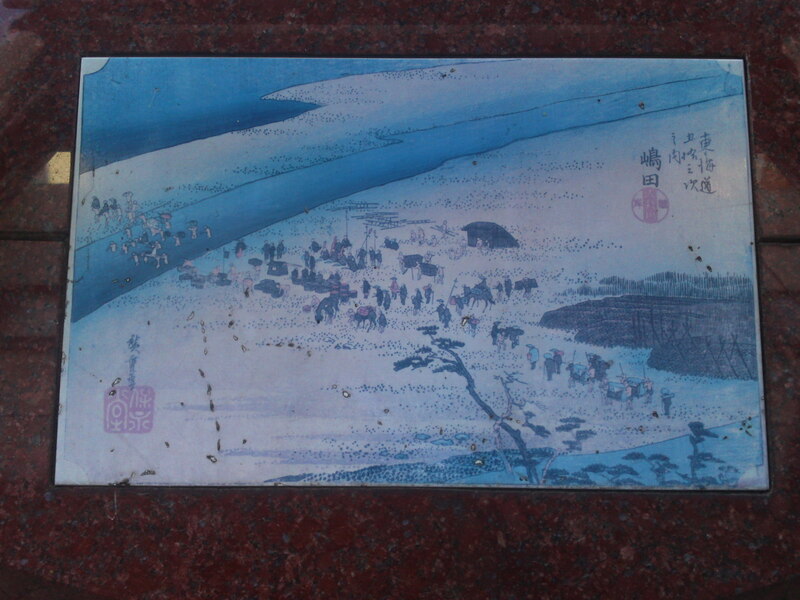 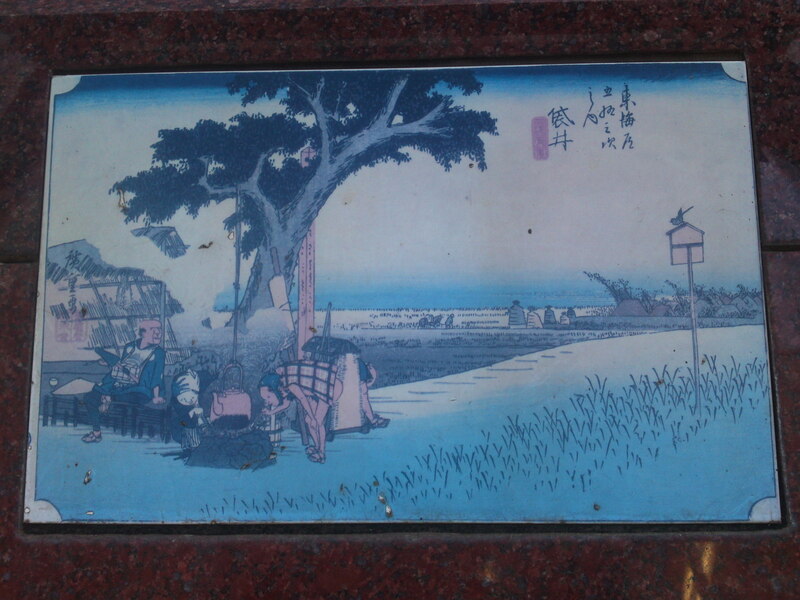 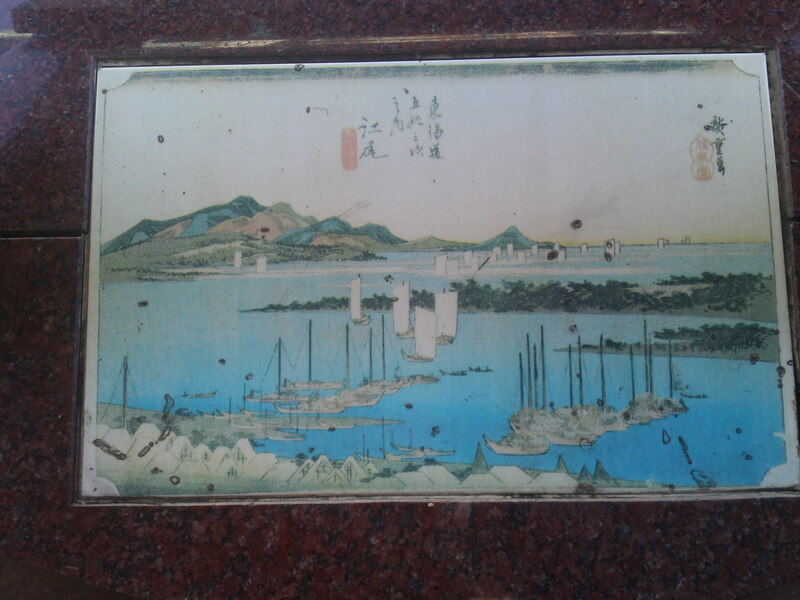 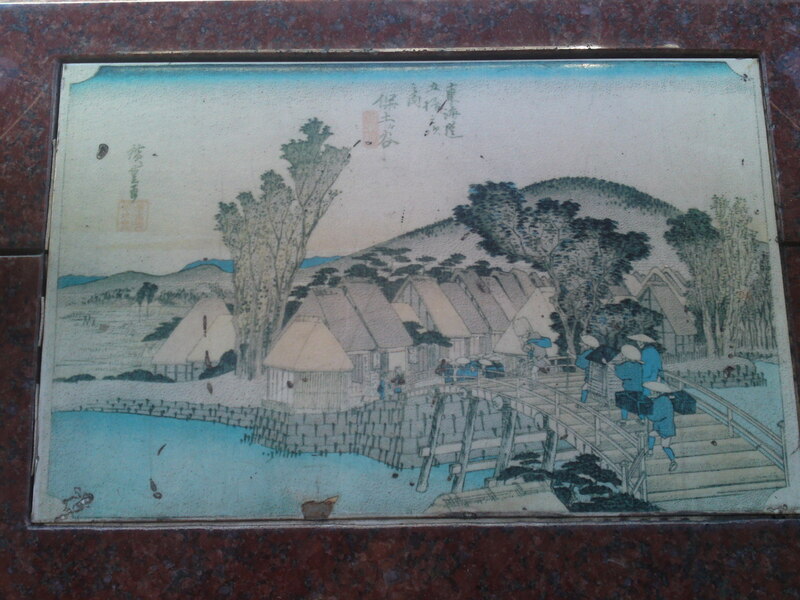 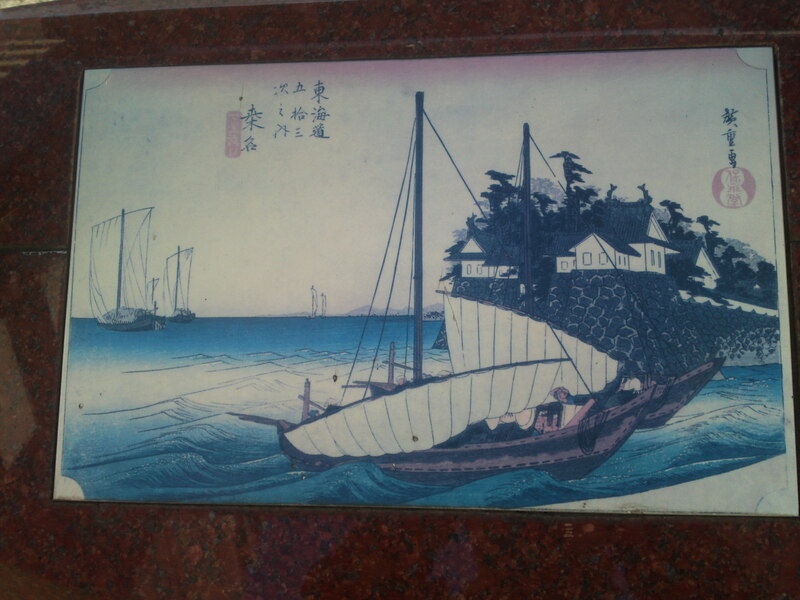 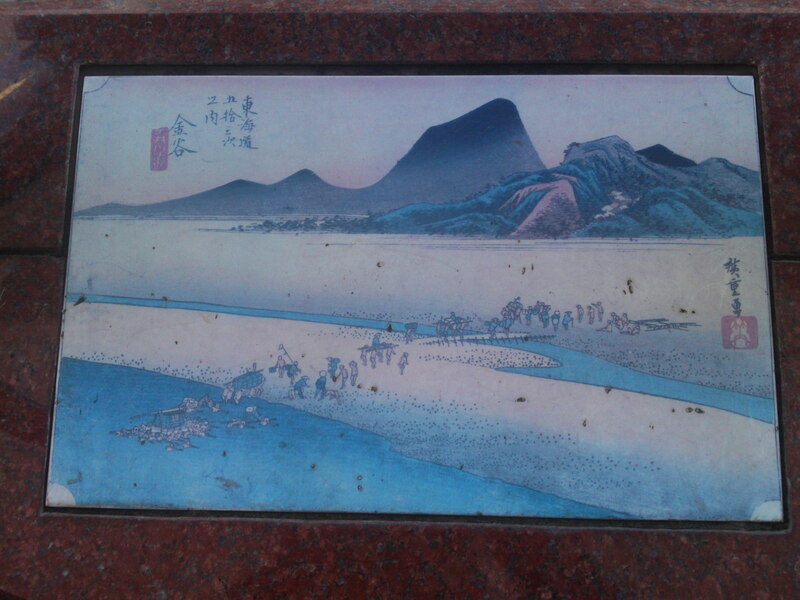 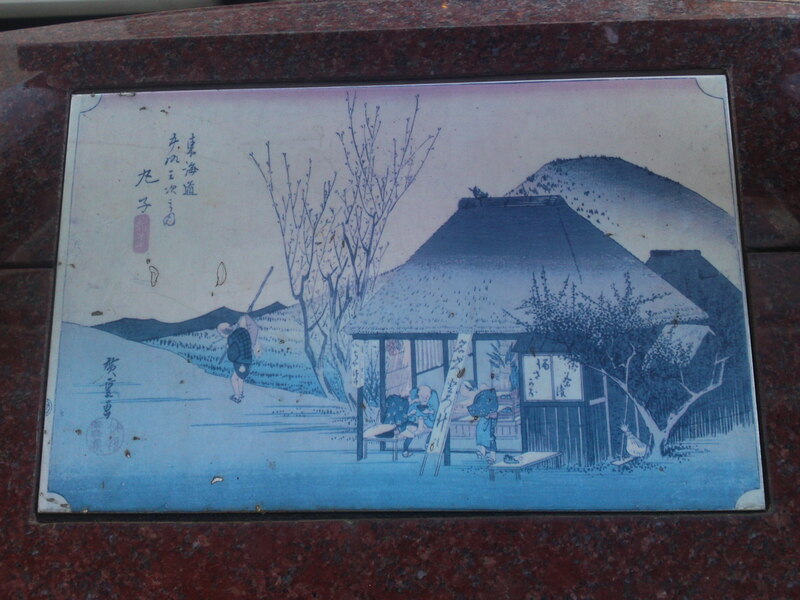 I Have already introduced the 45 (out of 53 + 2) Ukiyo-e By Hiroshige (Utagawa Hiroshige), the last great ukiyo-e/wood block prints master in Japan that you can find on red granite posts all along Gofuku Street in Aoi Ku, Shizuoka City! 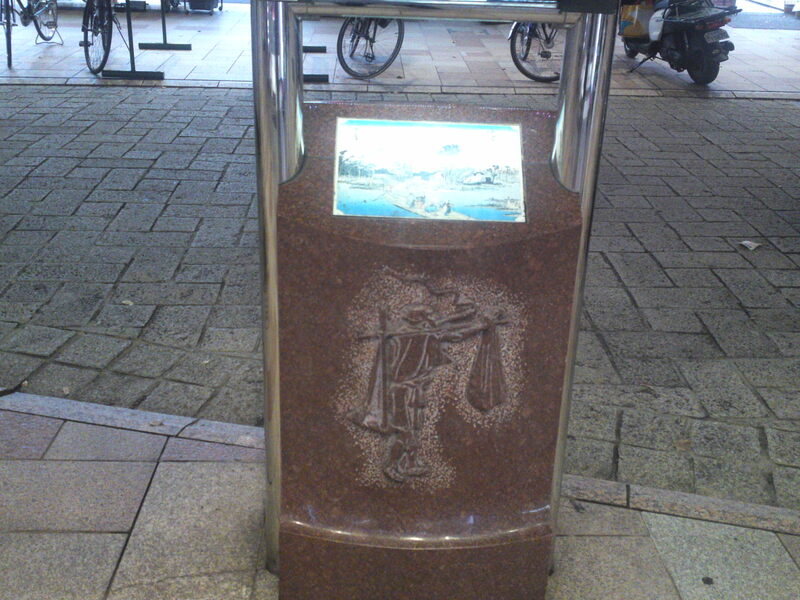 Now at night the same red granite posts are surmounted with large lights with the same motif of the ukiyo-e represented below! 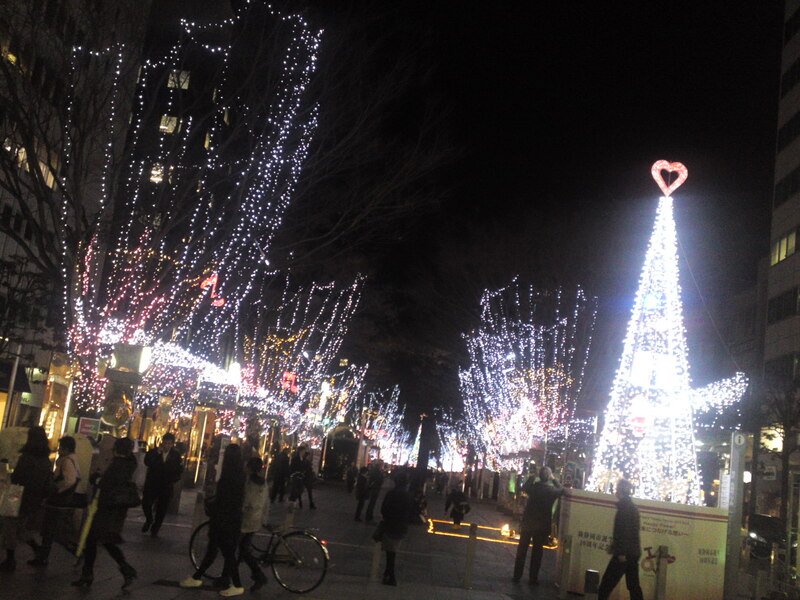 They certainly look better than those garish, expensive and bad taste illuminations in Aoba Street that Gofuku Street runs across! 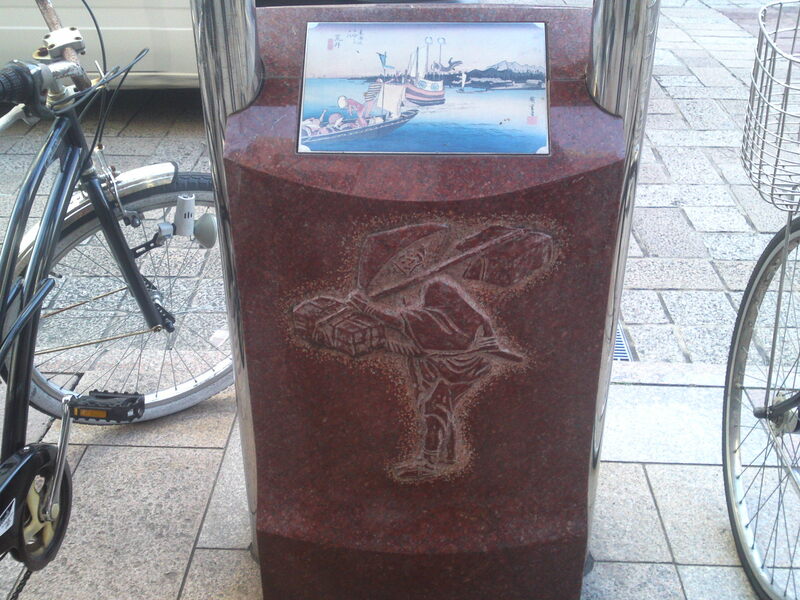 I’ll let discover/rediscover the others! 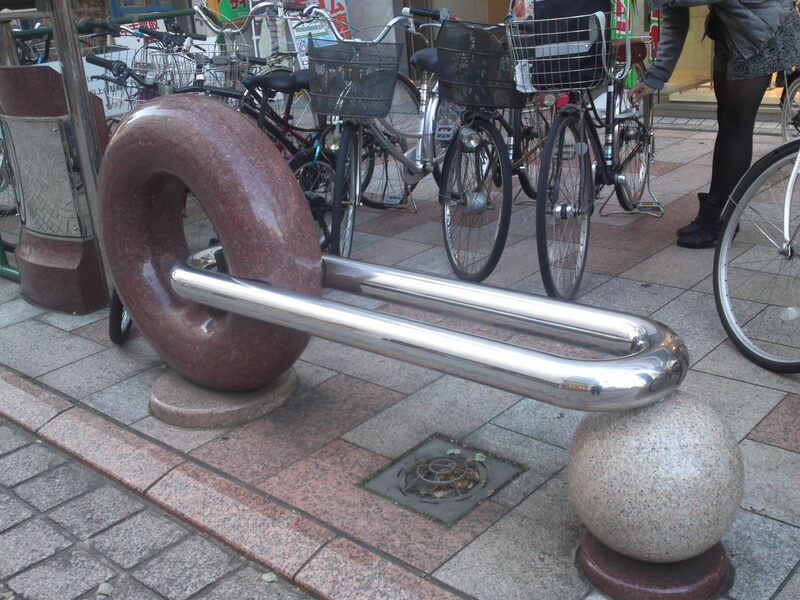 There 45 + 1 in all!